Our day was to begin at 8:00, to get an early start, but after a mishap with the Enterprise car rental, we were delayed until 9:00. That was no matter, because on peak summer days like this (June 22), the sun wouldn’t set until 8:30. 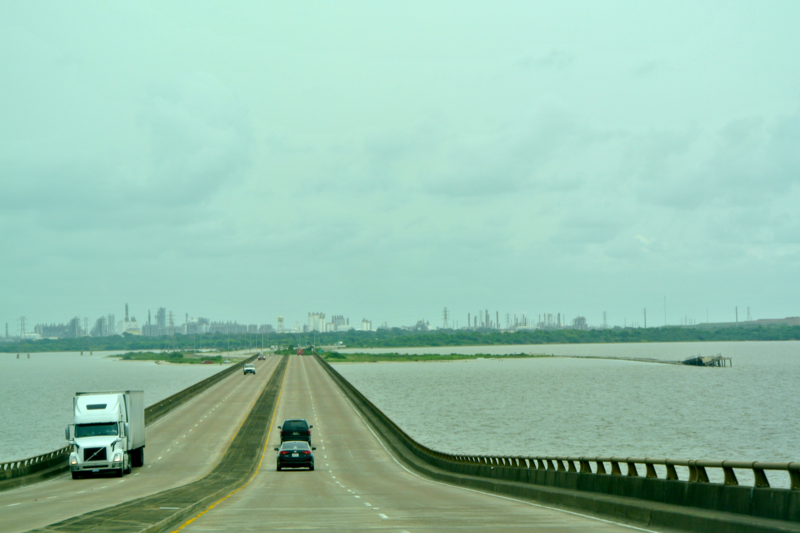 That gave us more than enough time to complete our trek through Texas’ Gulf Coast. 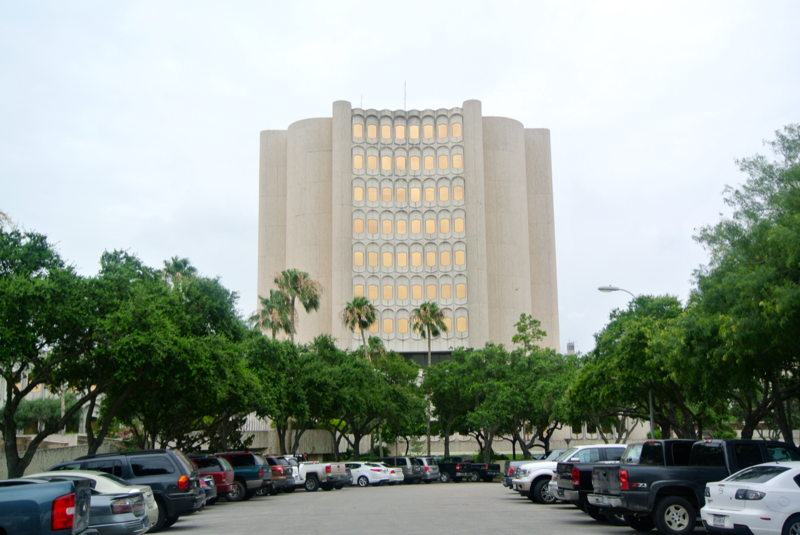 As we headed towards downtown, the Nueces County courthouse (destined to be #201 on my list), came into view at the base of several other skyscrapers. That’s it on the left, the cream-colored squatty one with several rows of windows. Well, we headed around the north side of downtown to exit, but we missed our mark. It just so happened that the exit we were headed for, was the last one before the Harbor Bridge. We were stuck on the road all the way until the other side of the harbor. 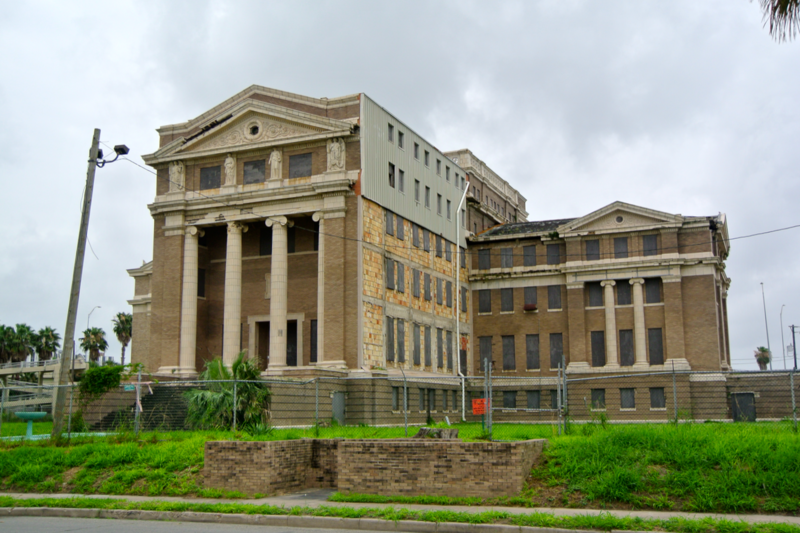 Before crossing the bridge, we passed by the retired (and abandoned) 1914 courthouse. 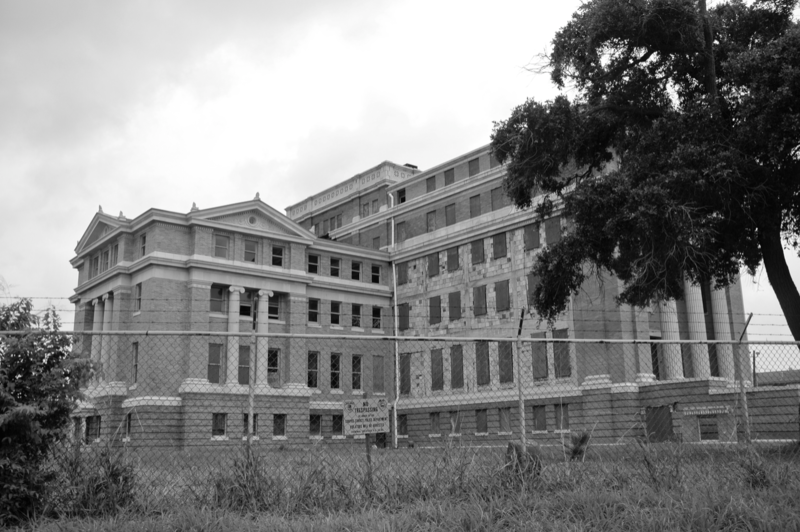 It rests just off the Interstate in a state of dilapidation and despair. This would be our next stop after the much more modern 1977 version, but first we had to cross the bridge, turn around, and come back to downtown. 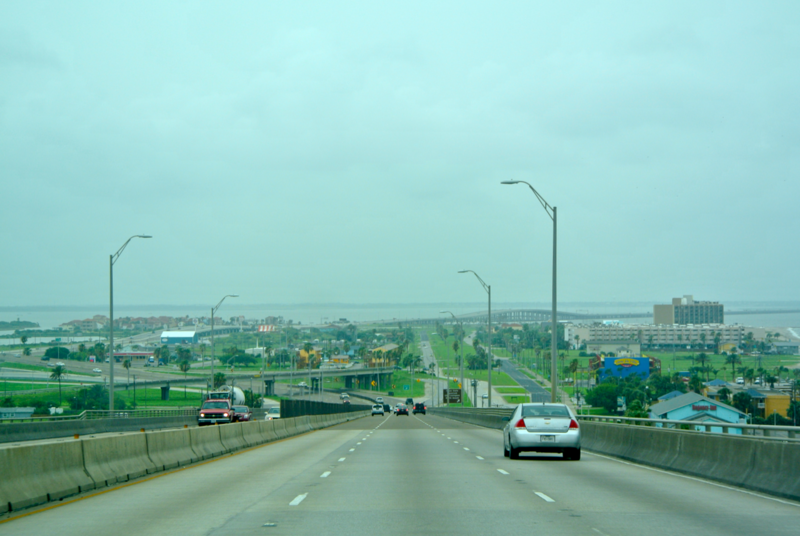 So once going back over the bridge for a second time, we made sure to take the right exit into downtown. Though it’s tall, the courthouse is still dwarfed by the rest of the larger buildings. It took us a minute or two to find. As I began photographing it, I walked towards what I could only assume was the front door, and was met by signs that read: Not A Public Entrance and KEEP OUT. I’m not sure what this concrete pit was ever supposed to be. My best guest would be a fountain of some kind. Today, it’s bone dry, and looks more like a zoo paddock than anything. 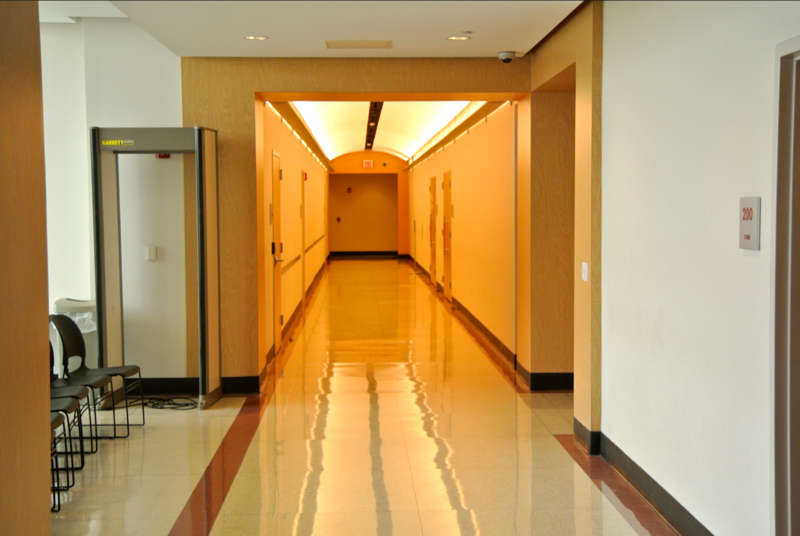 So instead of accessing it through this way, I walked around the building, finding entrances on all other sides. When I began walking back around to the parking lot and the side I had started on, I discovered that there was an entrance near that dried fountain after all. It’s a bit hidden, but the locals seemed to know where to find it. 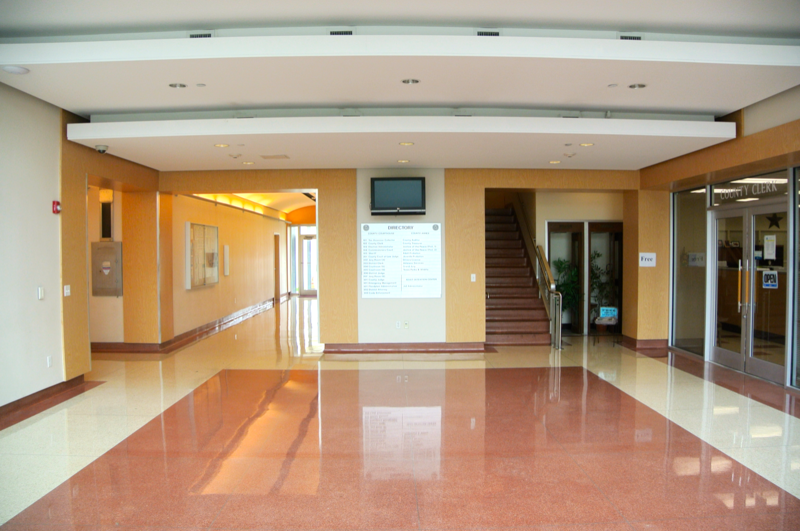 Here’s a shot of the interior, seen from that entrance. So after finishing with this courthouse, we headed back towards the highway, but instead of getting on it, we swung around to a lot adjacent, at the corner of Belden and Mesquite Streets. 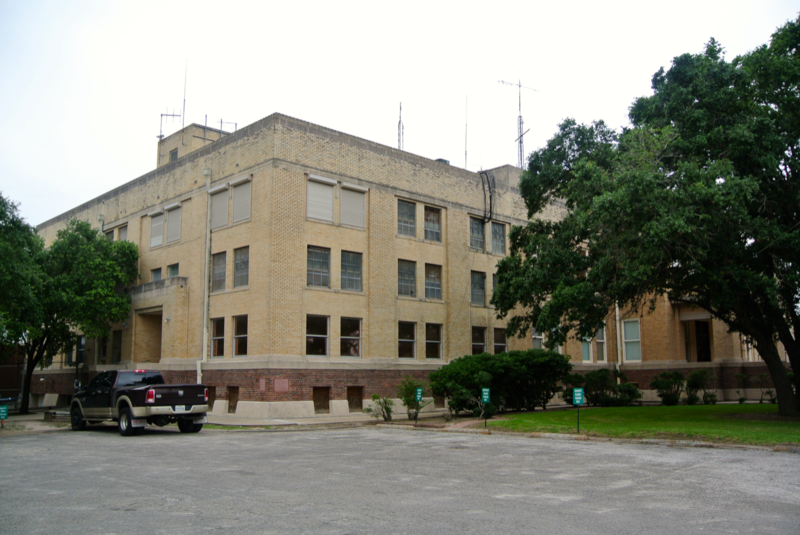 The original Nueces County courthouse sits here, out of use since 1977. The sad thing is that it looks like it’s just waiting for a demolition crew to give it a sweet release. This is one of the most depressing courthouses I’ve encountered on my journey, and for good reason. 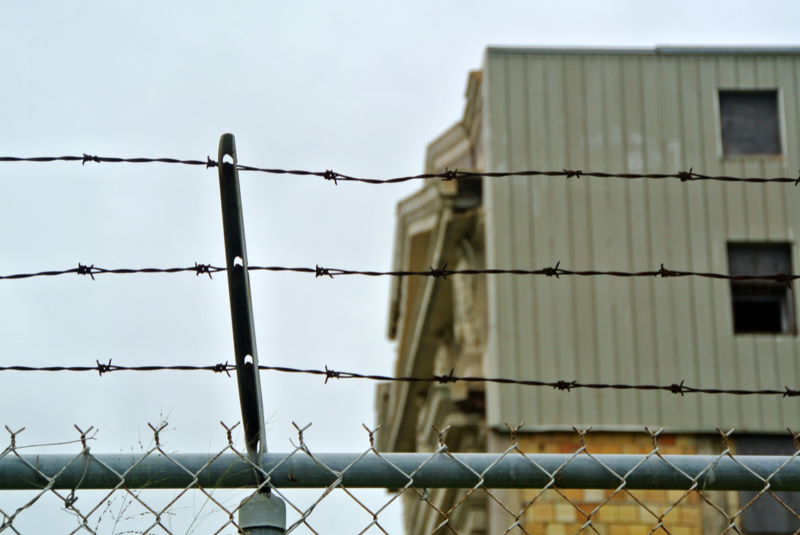 Today, visitors to Corpus Christi will find it surrounded by chain link fence topped with barbed wire, with its bricks crumbling off, windows shattered, eaves busted, walls cracked, and one of its sides overgrown with mossy weeds. 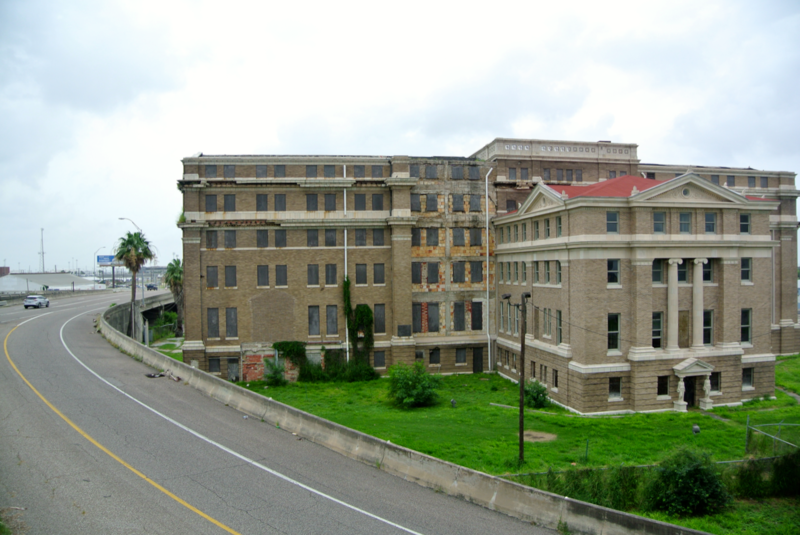 To think that this was once the center of all justice in Nueces County is quite ironic, because how the country has treated this one is anything but just. Loads of graffiti are evidence that no one gives signs like these any thought. Interestingly enough, a bridge for walkers that crosses the highway terminates right at the edge of the courthouse property. 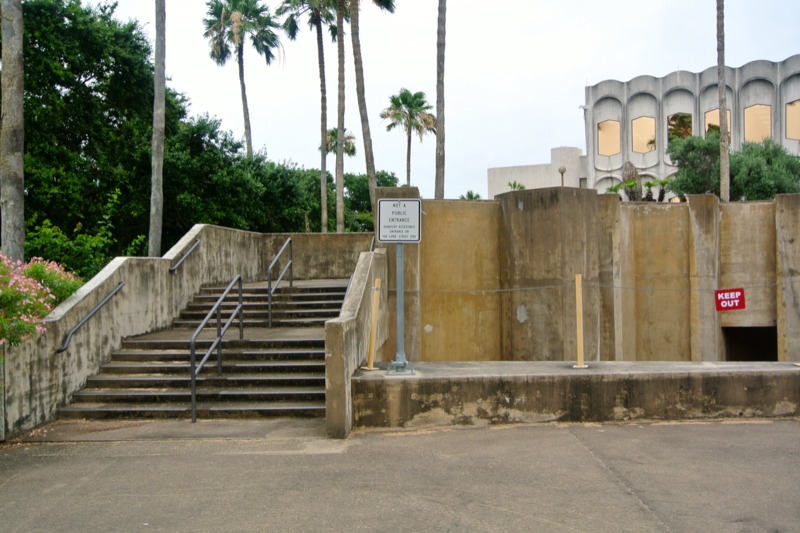 However, a gap between the cracked sidewalk and the end of the bridge would attest to the fact that it’s not used often. I found it quite useful in getting some pictures. Here’s a shot of the southern side, as seen from the top of the bridge. I read somewhere that part of this side was semi-recently restored. It’s easy to see which portion that might have been. But, I ask, why hasn’t the whole courthouse been “brought back to life”? I’m not claiming to know all the facts. 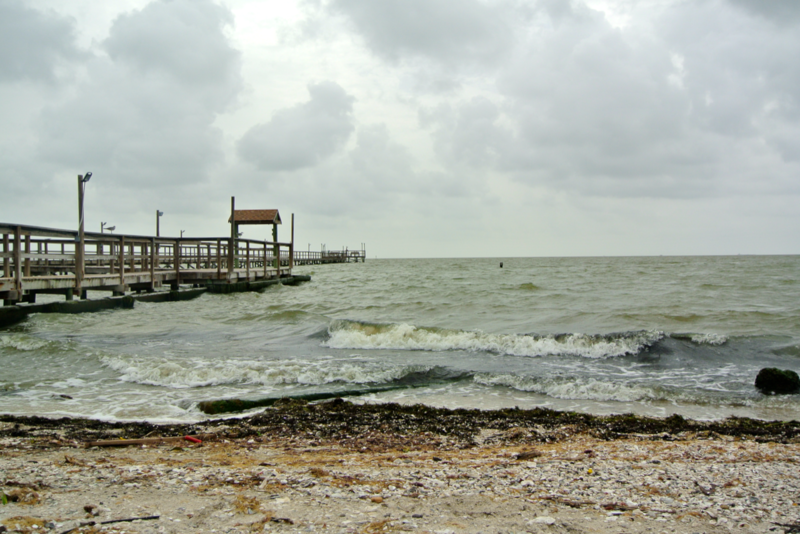 A bit of research should reveal why Nueces County is so trepidatious to restore it. Yet, no matter what is preventing the county from “healing” it, you cannot disagree about what this courthouse truly is: a downright shame. So, to brighten the mood, we set off across the Harbor Bridge again. But, this time we weren’t aiming to turn back. That bridge you see in the distance was our next destination. It’d be the one to carry us to our next county. 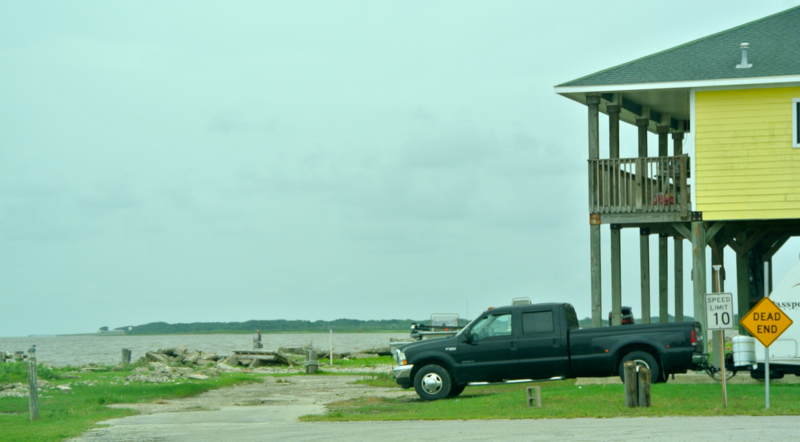 Aransas County boasts such signature beach communities as: Aransas Pass (partially), Fulton, and Rockport (the county seat). As the owner of the restaurant where we ate lunch put it, there’s only two things to do in a place like this: fish and relax. There’s plenty of both going on, for sure. Everyone that lives up and down the coast has the relax part down. In fact, the courthouse architects also seem to have embodied that philosophy, as the design they put together looks like it didn’t take much effort. 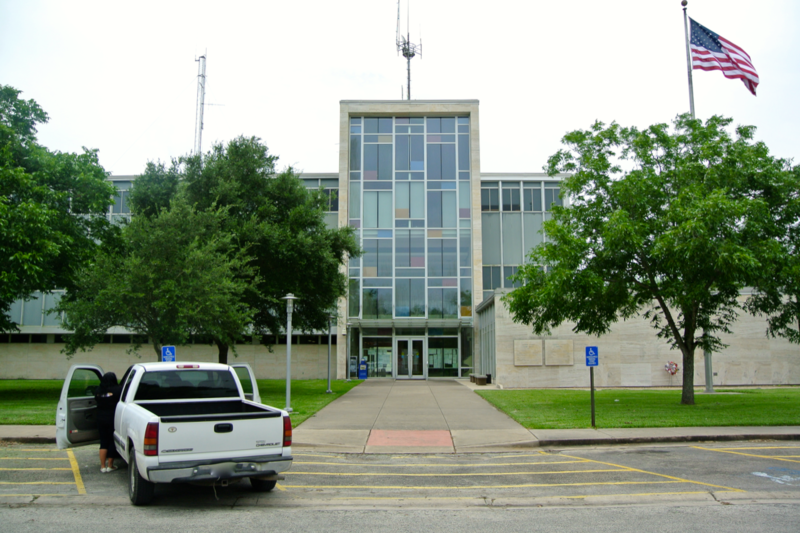 I can’t recall where I read it, but in one place I’ve heard the architectural style of the Aransas County courthouse referenced as the “motel style”. Honestly, I’ve seen Motel 6′s with more characteristic than this. 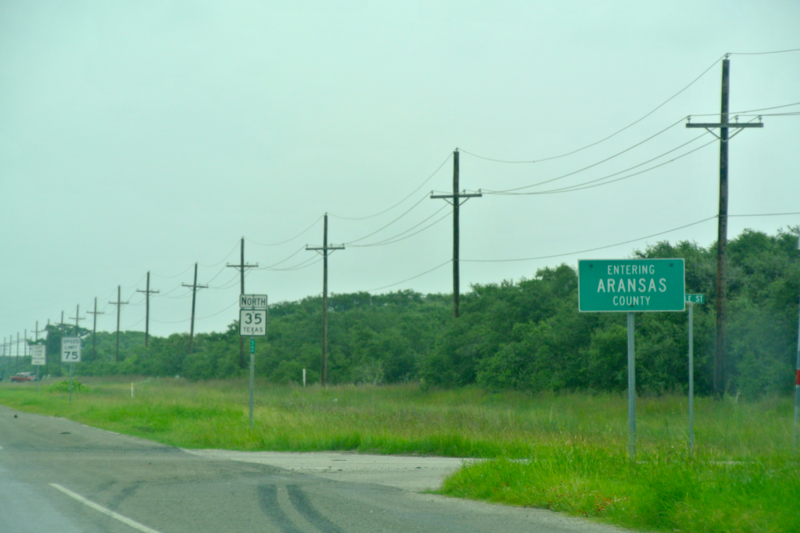 But, there’s no intentional slandering to Aransas County meant by that. You could probably just say I’m bitter that, in the 50s, they demolished one of the coolest courthouses to ever stand in our state. 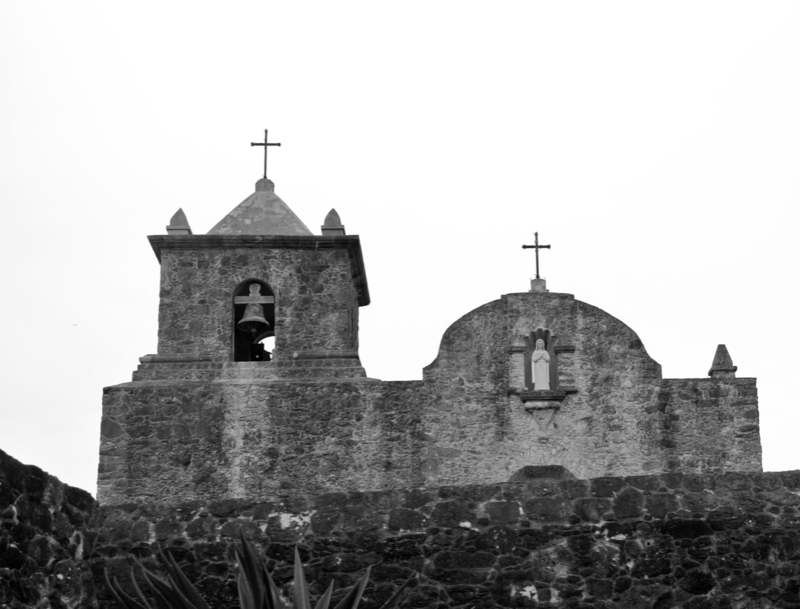 It had influences from both Spanish colonial and Mission-styled buildings, and was complete with a teardrop dome on top (not to mention its design came from James Riely Gordon). How could they even think about getting rid of such a thing? Curse 1950s modernization! We’ll all just have to settle for these “motel style” creations until an architectural revolution occurs sixty years or so from now. But by then, this one’ll be registered as a historic site by the THC and nobody will be able to touch it. Oh well. 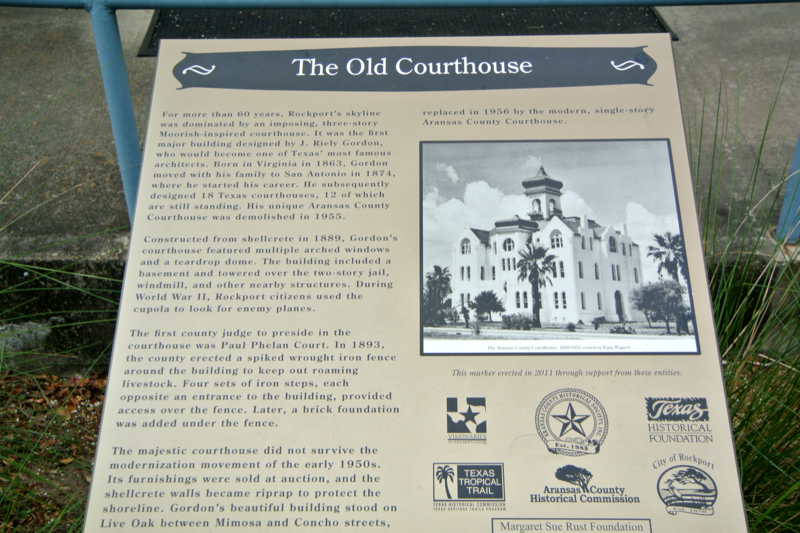 According to the historical information presented outside the courthouse’s front door, the original building stood on this adjacent lot. At least they didn’t build an annex on top of it, or anything. Driving parallel to the bay offered some nice pictures of fishermen and sea birds as we transitioned into the nearby community of Fulton. In Fulton sits the Fulton Mansion, home of George W. Fulton, a land developer and entrepreneur. 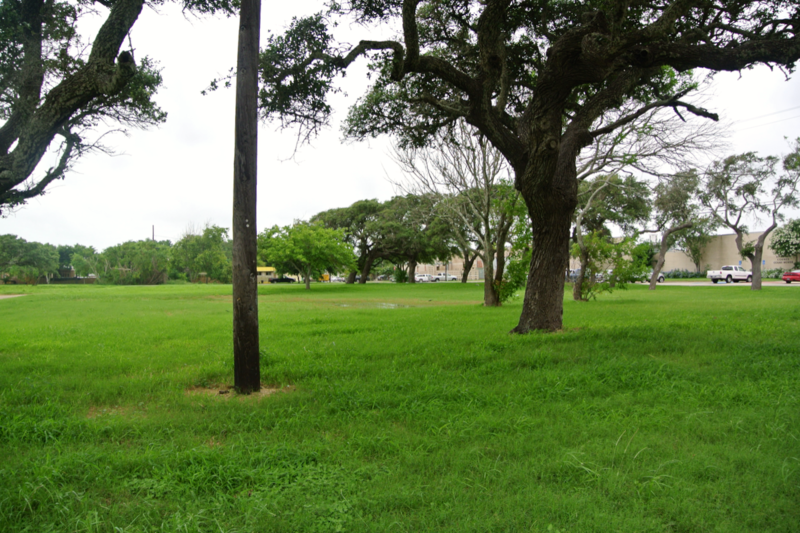 After moving to the Rockport area, Fulton developed a fortune from shipping cattle hides to New Orleans. To symbolize his success, he built his Oakhurst mansion. 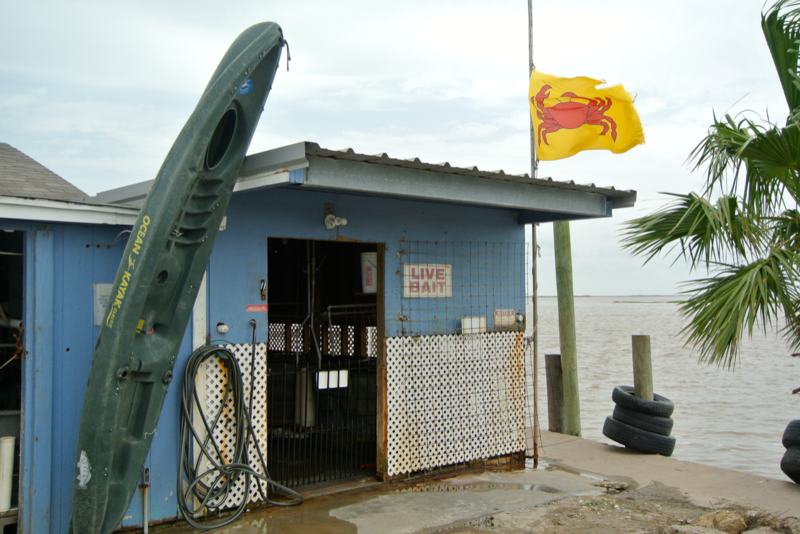 Today, it looks right out on to Aransas Bay and is a museum. Unfortunately, it was under restoration at the time of my visit. 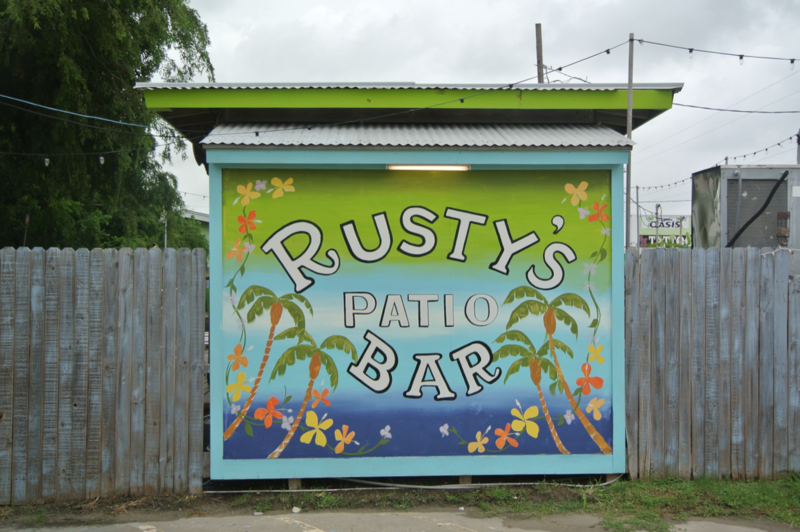 Up next was lunch, which was at Rusty’s Patio Bar. 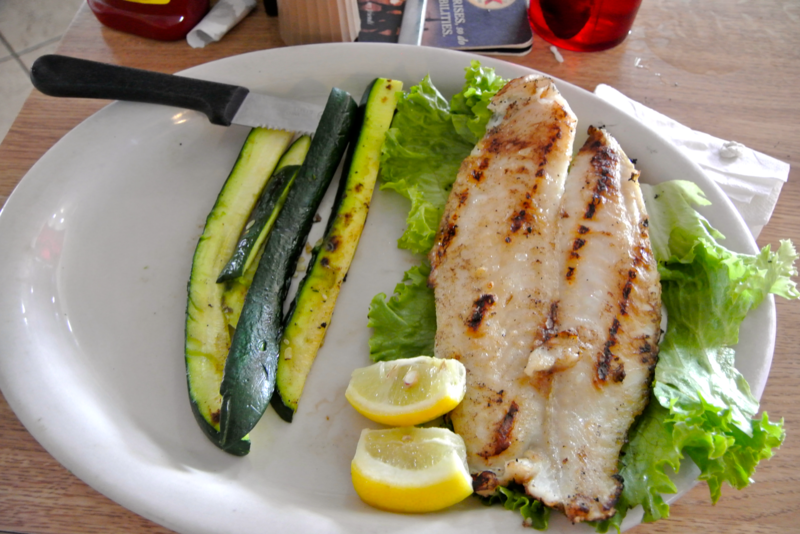 Luckily for us, the shrimp and the grouper were the latest catches. We had both. 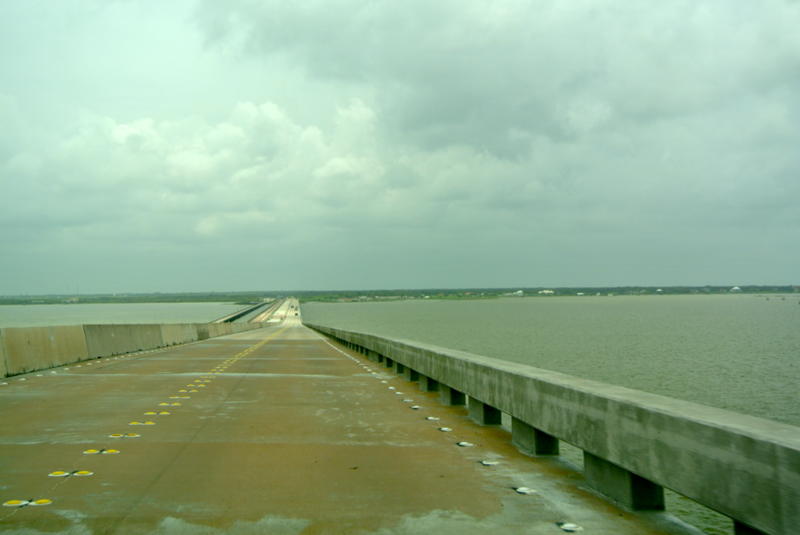 Leaving Rockport behind, we passed over the strait between Copano and Aransas Bays, on our way to Calhoun County. As we traveled on the bridge, a reckless driver tried to pass us, and had my grandfather not slammed on the breaks, would have had a head-on collision with a car in the other lane. We very well could have been involved in that. Fortunately, we made it out of that alive, and began the journey to Calhoun County. 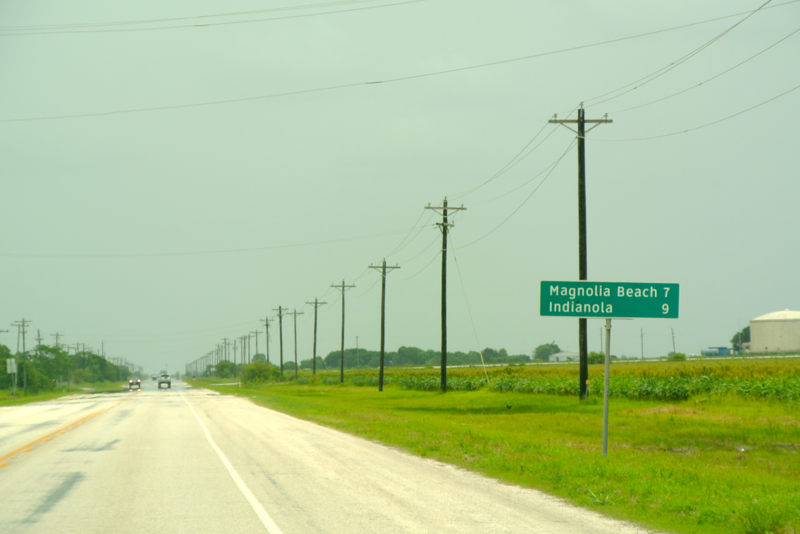 To get there from Aransas County, the highway first passes through Refugio County, where the countryside is flat and heavily cultivated. If I hadn’t known any better, I would have assumed that the terrain I was now traveling through belonged in the Panhandle, rather than South Texas. 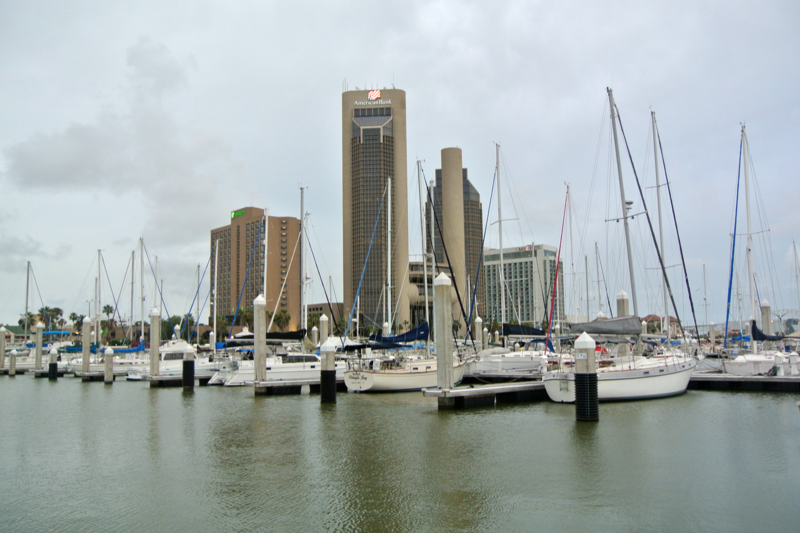 In about an hour past Rockport, we arrived in Port Lavaca (population-wise the largest port between Corpus Christi and Freeport). 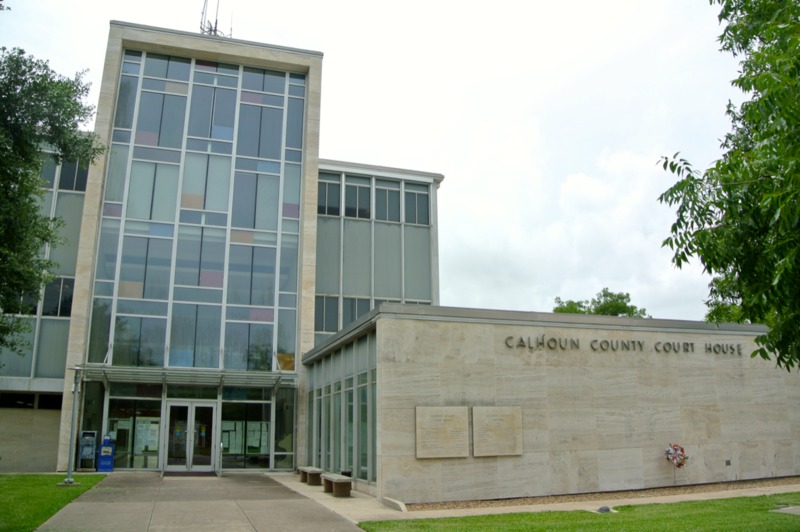 It’s also the seat of Calhoun County. 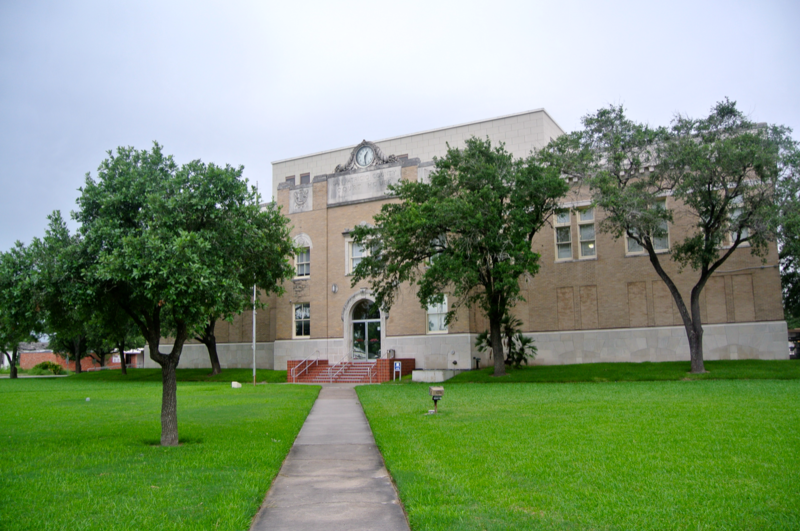 The courthouse here, just like that in Aransas County, is nothing special. 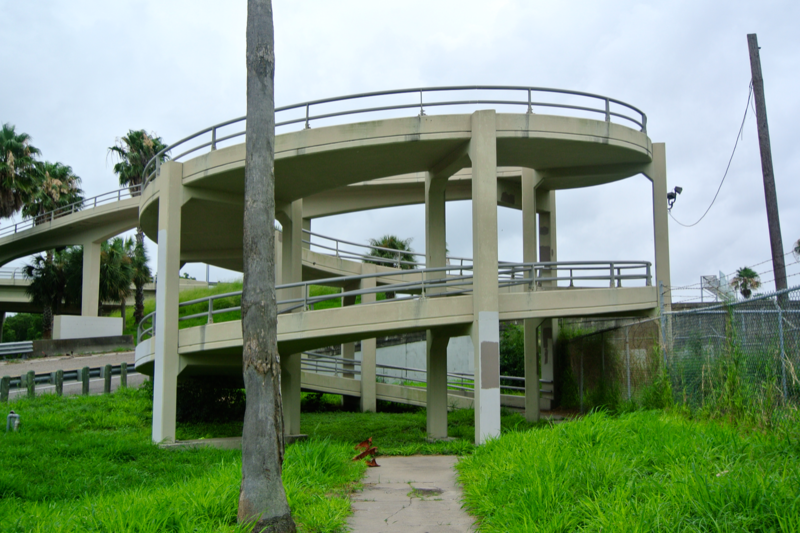 Built in 1959, this modern creation was the work of the simply named firm “Rusty and Martin”. 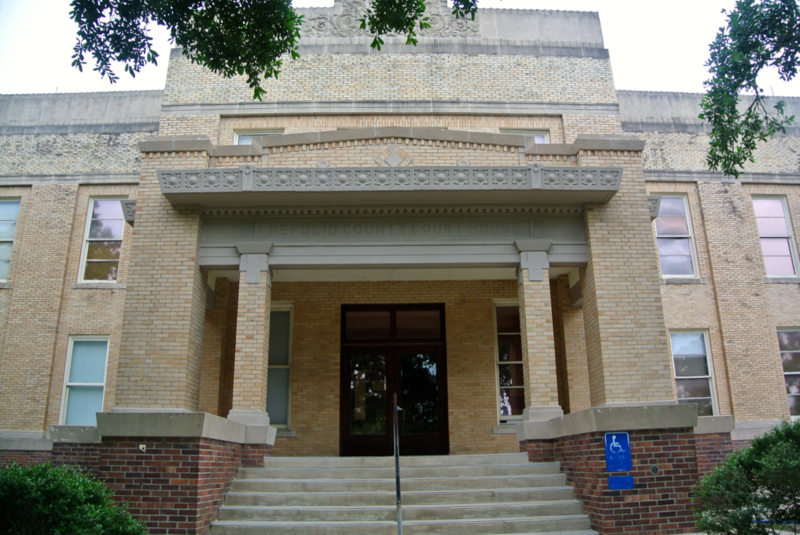 It replaced a 1911 version that was heavily influenced by the Greek Revival style. Despite its relatively minimal attempts at aesthetic appeal on the exterior, I found the interior of the courthouse surprisingly pleasant. Maybe it’s just me, but the shades of orange, brown, and red just look so much better than the drab grays and whites you’d find in other modern courthouses. 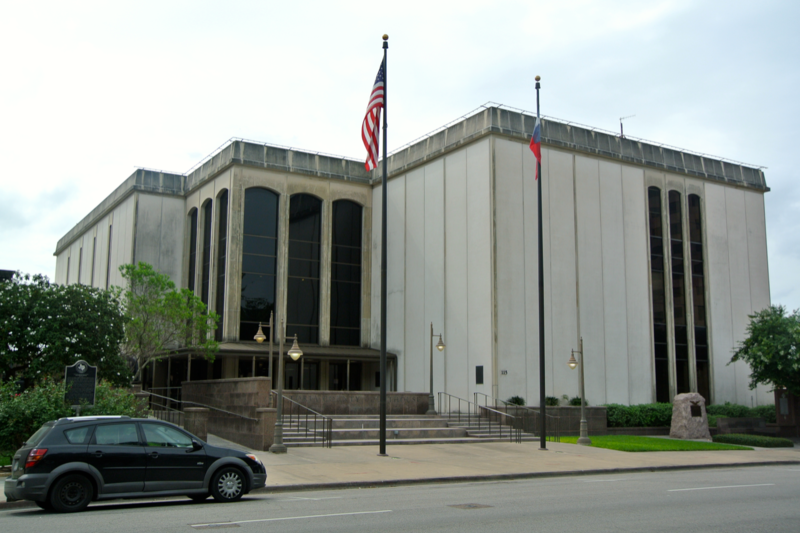 The color scheme in this one tilts much more of a nod to older architecture than to the 1950s modernization phase of Texas courthouses. Thank goodness for that. While I was busy photographing the inside, I heard my grandfather speaking with a courthouse patron, asking him about Indianola (our next stop). The man described it as a “small fishing town with a neat beach and a store”. He wasn’t wrong. That’s about all there is. 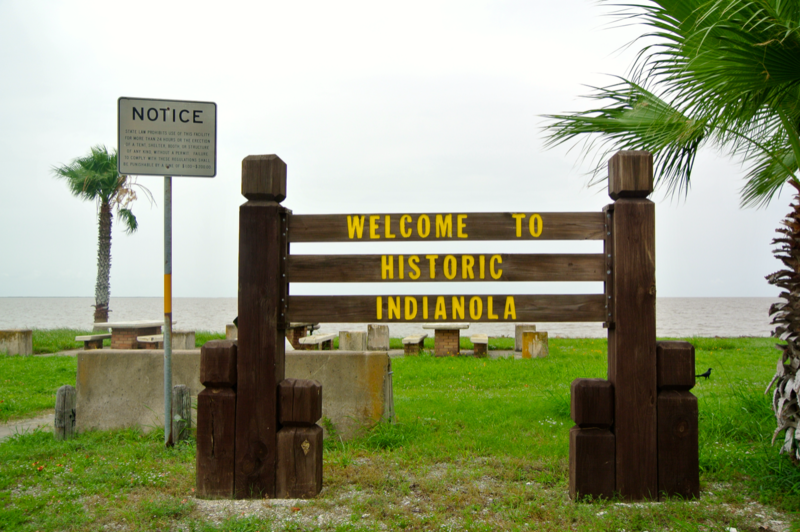 Indianola, located in southeastern Calhoun County, was on my to-see list because it was once a port of a size to rival Galveston. 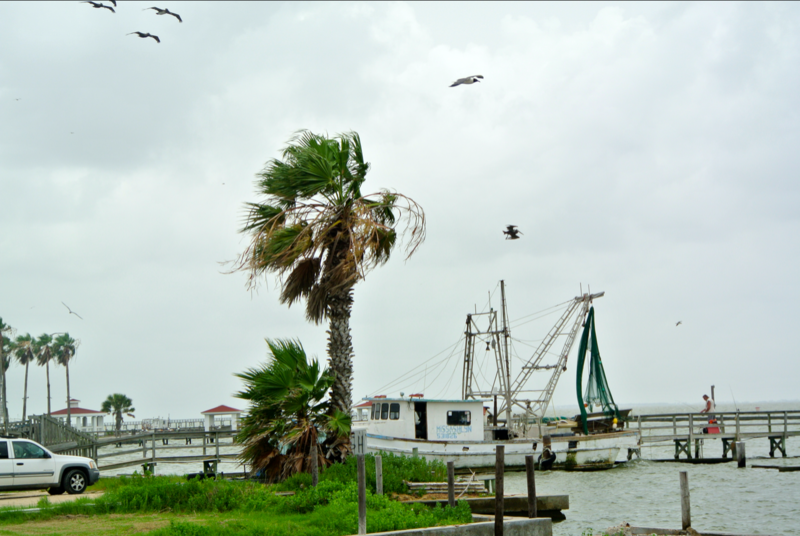 Historically, Indianola was one of Texas’ most important cities, yet successive hurricanes throughout the second half of the 19th Century destroyed the port, forced citizens to move inland, and blew enough dirt and mud into the bay to make it too shallow for major vessels to sail there. By 1900, Indianola had lost all of what it once had. This is worth reading. It’s yet another intriguing and amazing story that came from Indianola. Unfortunately, there just isn’t much here anymore, aside from beach homes. It’s been through many major changes in its time. After all, in its hey day, Indianola was the county seat. 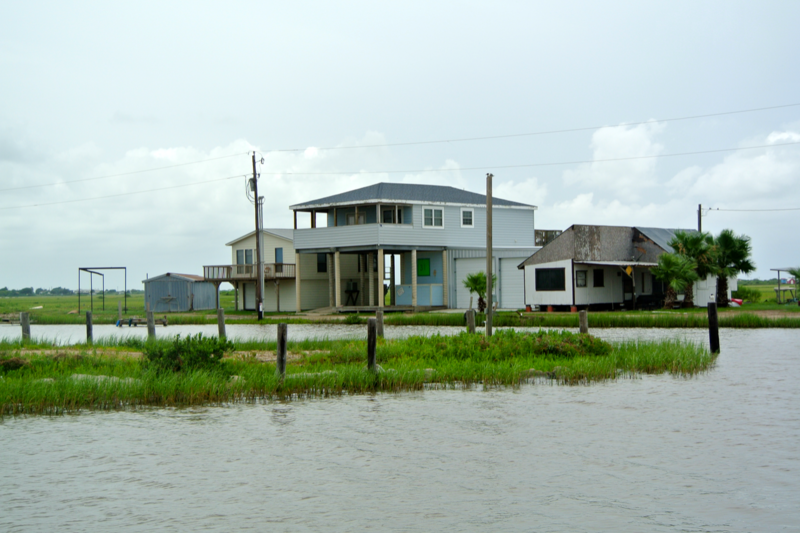 Yet after the hurricanes damaged the vitality of the bay city, Port Lavaca rose to replace it. Just like the man in the courthouse said, there was a store, albeit a small one. It was at the very end of the road. 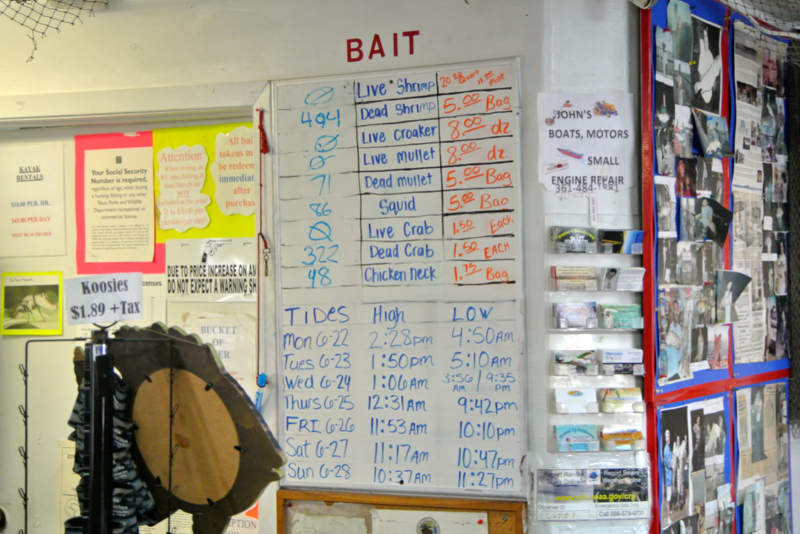 At the time of our arrival, those two men you see were loading up on their bait. The store seemed to have a good selection of it. This little stretch of water here was all that stood between this house and the store. I figure whoever lives there can just boat on over whenever they need something. As we drove out of Indianola we passed by what appeared to, at first glance, be a kind of historical marker. 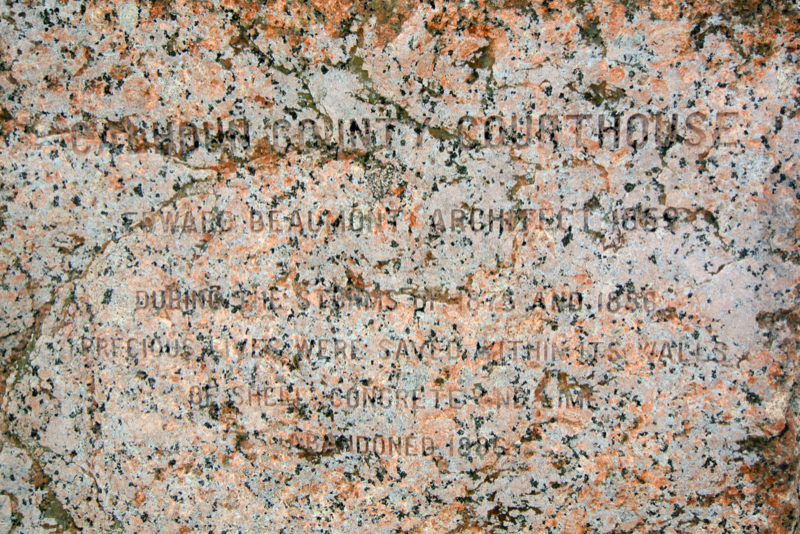 But after closer inspection, I realized it was a foundation piece of one of Calhoun County’s past courthouses. I of course had to take a picture. 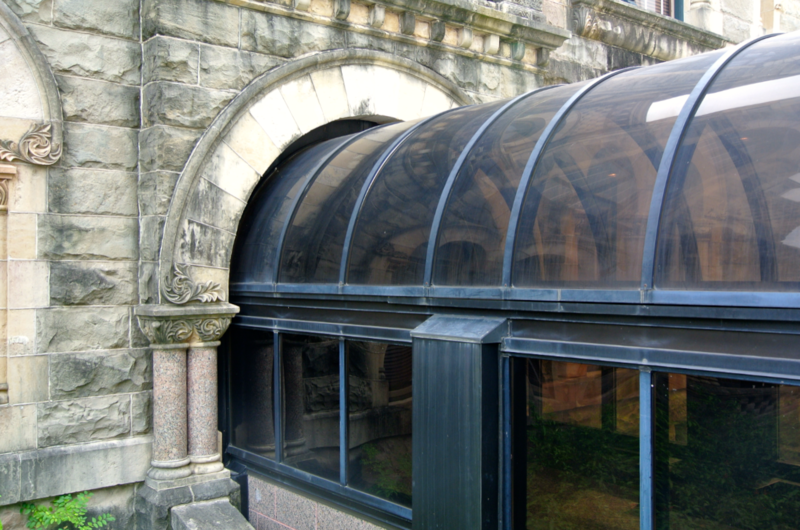 During the storms of 1878 and 1886, precious lives were saved within its walls of shell concrete and lime. Near the northern terminus of Indianola was an even more interesting historical find (in my opinion). In fact, this was one of the main reasons I wanted to come to see the town, anyway. 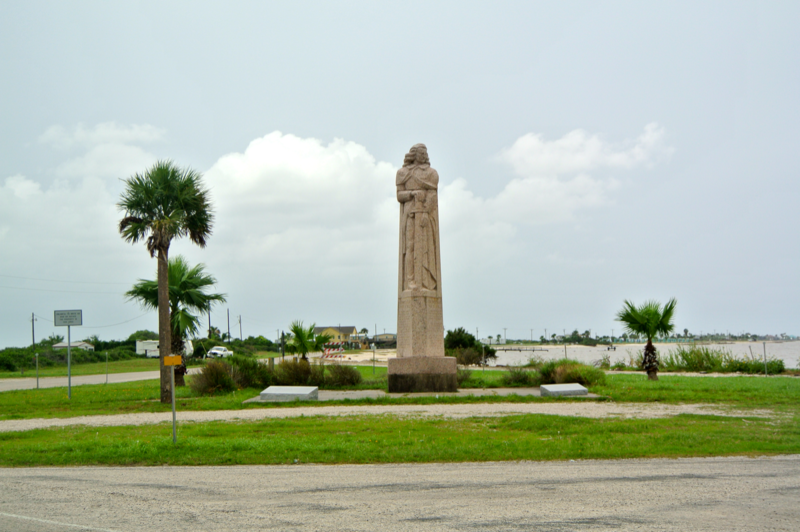 It’s a statue of Rene Robert Cavelier Sieur de La Salle, the first Frenchman to land in Texas. 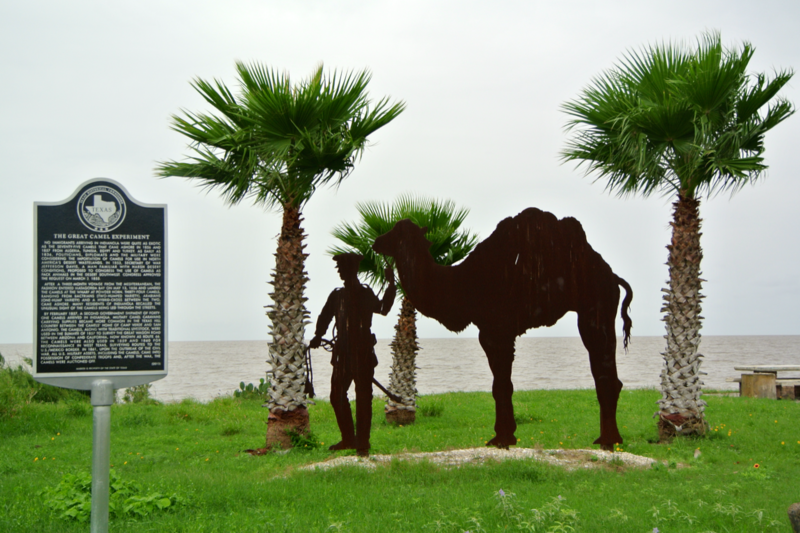 Seeking the Mississippi, La Salle landed on the shores of Matagorda Bay, and established his colony Ft. St. Louis on the banks of what is today Calhoun County. He began the French interest in the area (which would eventually lead to the developing of New Orleans) and is responsible for the French claim to Texas (remember that France is one of Texas’ six flags). Though he was murdered in a crew mutiny in 1687, he is best remembered for his contributions to the United States. It is because of his work that France took more of an interest in the New World and developed its territory called Louisiana. You’ll recall that in 1803, Napoleon sold the land to America under the Jefferson administration, and thus the U.S. doubled its size overnight. This is known to history as the Louisiana Purchase. You can thank La Salle for that. 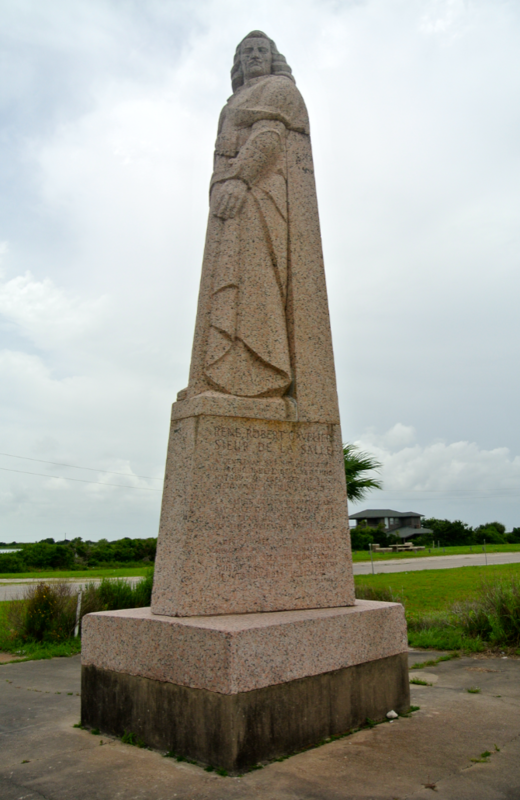 They say Ft. St. Louis was founded only miles from Indianola, and as a result, his statue was erected here in 1938. It’s truly an interesting find. So we said goodbye to La Salle, Indianola, and the camels and took off back north on state-maintained road. 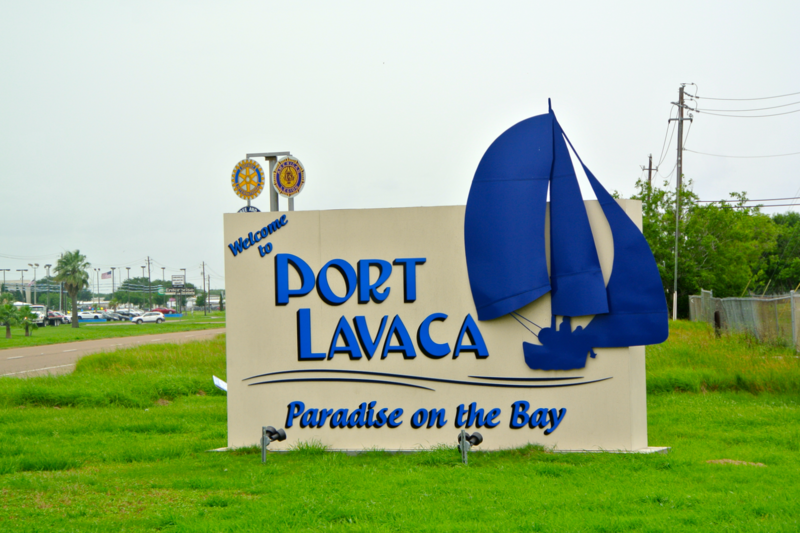 Before heading on to our next destination, we first had to pass back through Port Lavaca. I think the courthouse is an indication of the validity of this statement. No further comment. 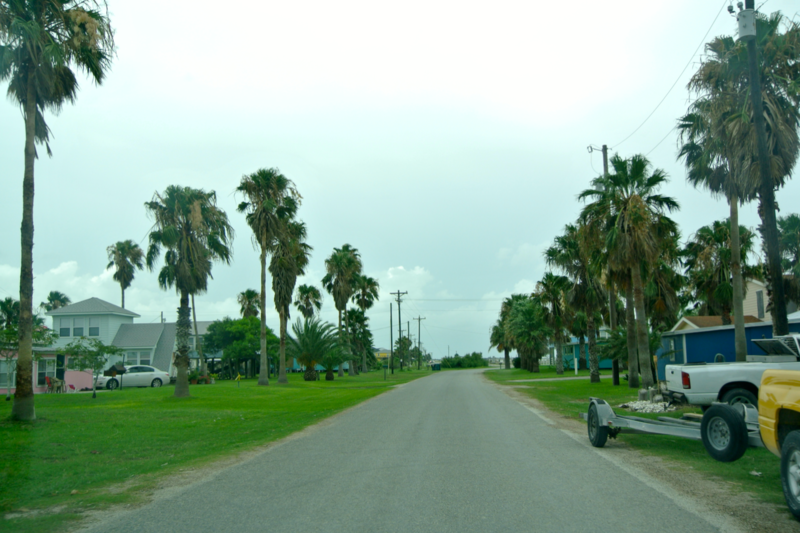 Heading east on Highway 35, we took the causeway over Lavaca Bay, passing from Port Lavaca to the smaller community of Port Comfort. This area is dominated by the Formosa Plastics Corporation. You can see the various spires of its production plant in the picture below. 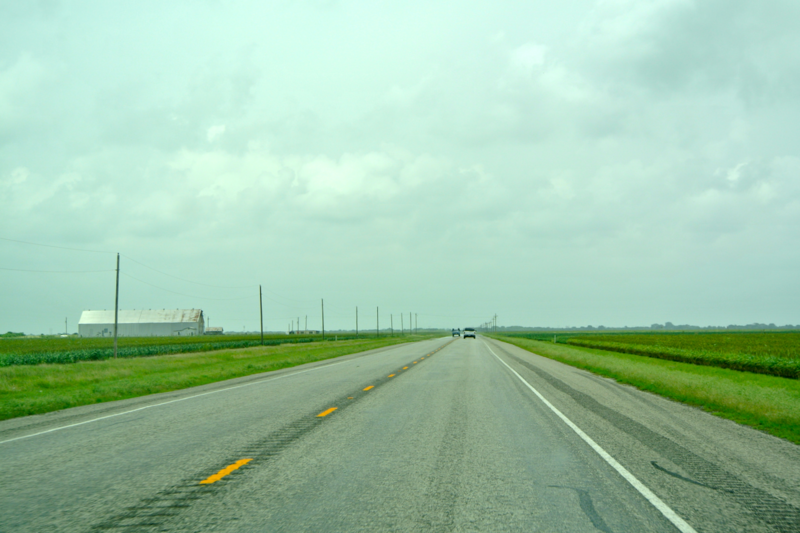 At Port Comfort, we turned left to head north on FM 1593, passing right by the Formosa plant. It is a huge operation. 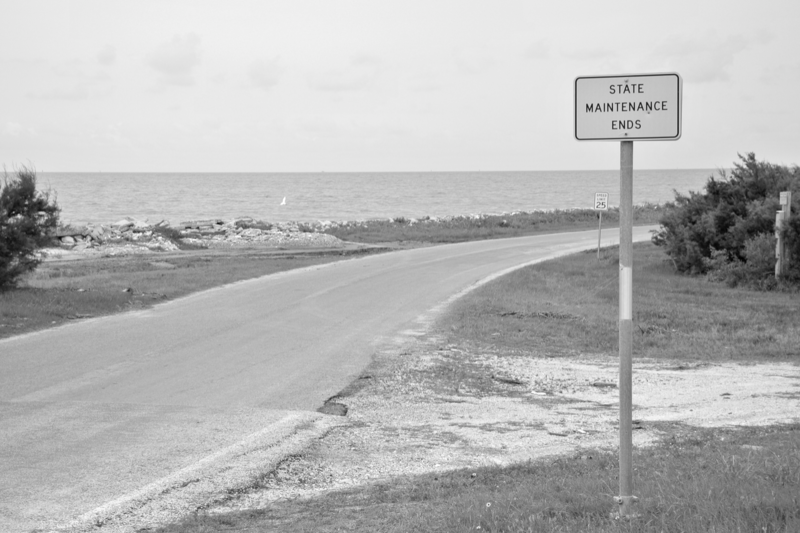 Along this path, we navigated the backgrounds with Jackson County in mind for our next stop. Part of our route had us passing over the Palmetto Bend Dam on Lake Texana, a hotspot for recreational fishing in the area. In only six more minutes or so, we’d arrived in the seat of Jackson County. 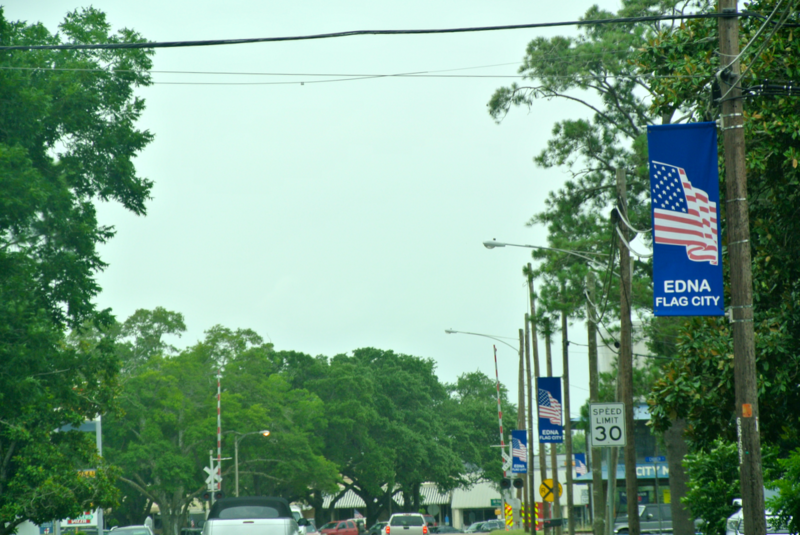 And after stopping briefly at a gas station, we got acquainted with Edna, “Flag City”. The courthouse, yet another modern creation, was up on the left. Though I was getting remotely bored by these buildings, Jackson County’s certainly had more “life” than any of the previous courthouses of the day. I figure it’s the orange brick and pink flowers that do the trick for me. I was surprised to find a very unique entry hall, as well. You don’t find one of these every day. To the immediate right of the main doors is a small picket fenced area, marking off a carriage. 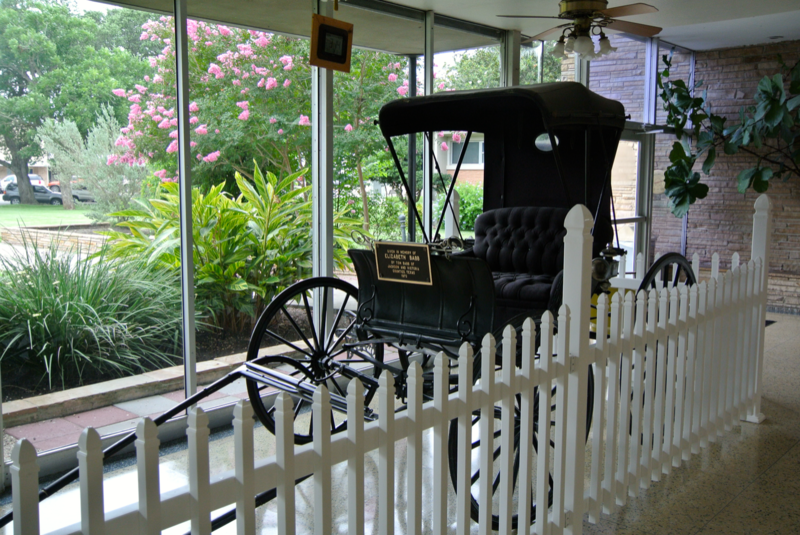 This was donated by Tom Babb of both Jackson and Victoria Counties, in 1970, to honor the memory of an Elizabeth Babb. The exact nature of their relationship is unknown to me. I’d like to know how old this is. The carriage wasn’t the only cool find. Turns out the historic cornerstone of the previous courthouse (dating from 1906) is on display indoors. 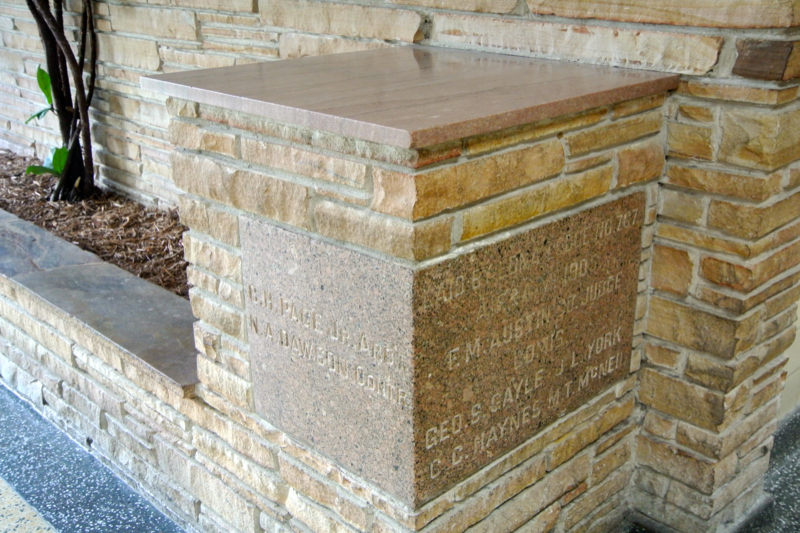 I’ve found during my project that the displaying of historic cornerstones follows a general trend of outdoor placement. 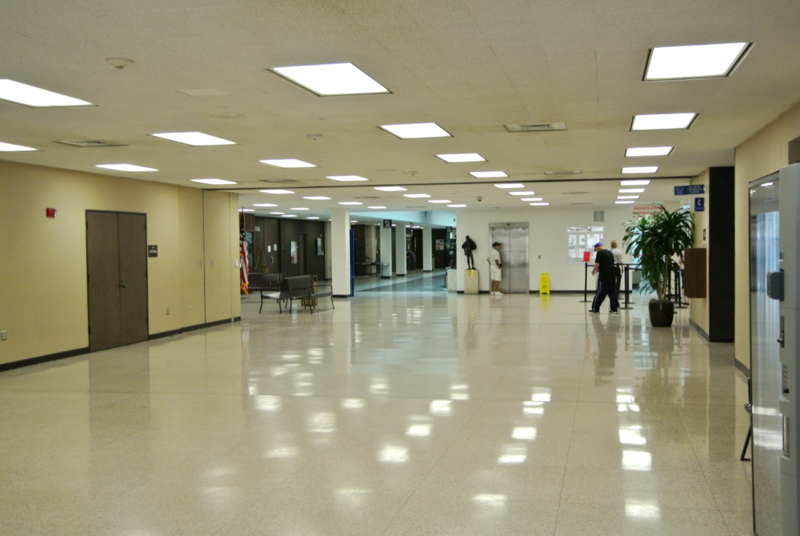 To my knowledge, this is the only one inside its courthouse. 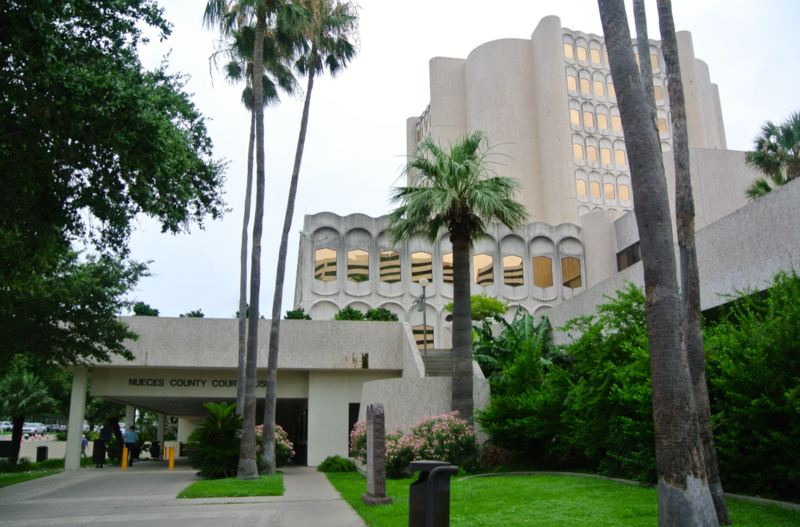 While photographing this courthouse, I ran into some landscapers in orange clothes. It wasn’t long before I realized they were inmates. 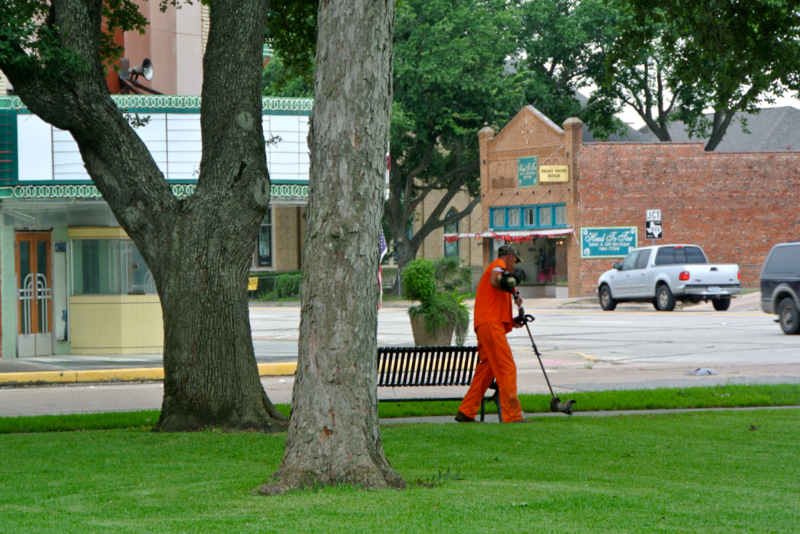 Now this isn’t the only time I’ve seen county inmates working on the courthouse grounds. This has also happened in Grimes, Childress, and Galveston Counties while I visited, just to name a few. You can see the building just past him has a colorful marquee. I spotted the same and walked over to photograph what I assumed was a working corner theater. But, it didn’t take long to realize that it hasn’t been used for some time. 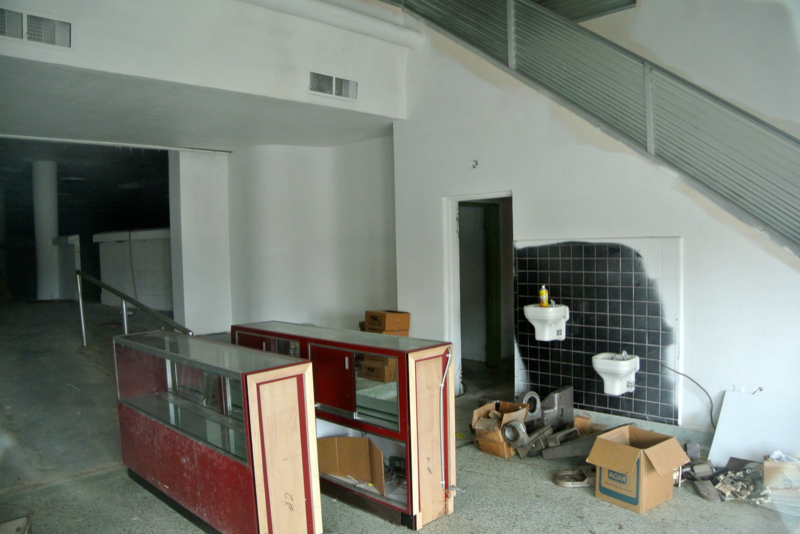 The shot below, taken through the doors, reveals a state of disrepair within the interior. 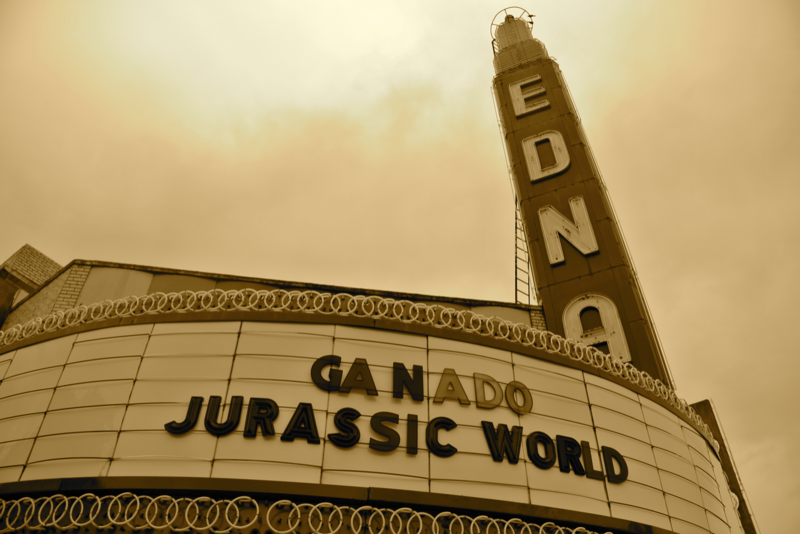 Instead of advertising films showing at this location, the marquee is now used to tell the people of Edna what’s playing over in Ganado, one town over. It’s sad to see such a nice building out of use. 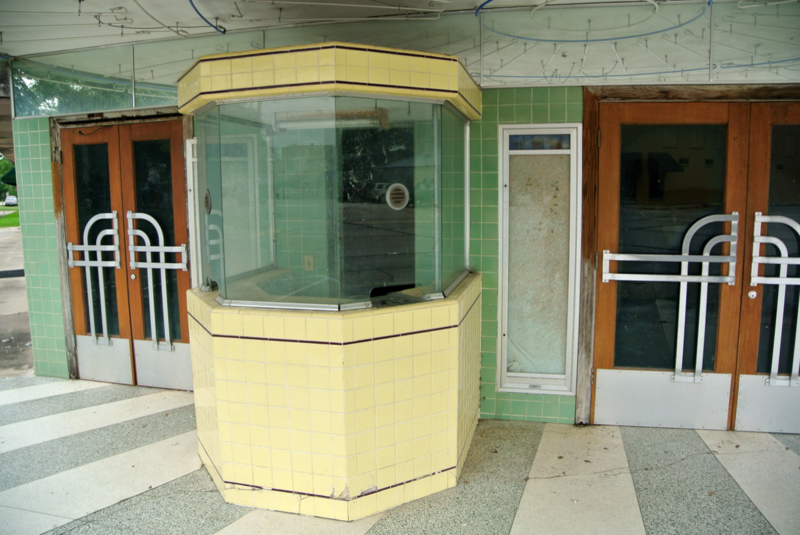 I hope Jackson County is planning on reopening the Edna Theater. There was of course no time to stay and find out. Time was already getting ahead of us. It was about 3:35 when we left Edna, and there were four more stops to make (one of which would take nearly a whole hour). We set out west now, beginning the slow journey back to Corpus Christi. 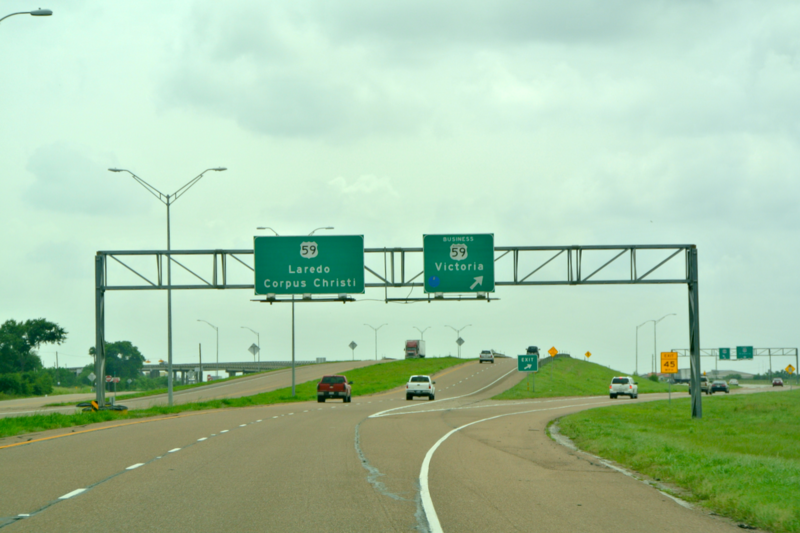 In approximately thirty minutes, we’d arrived in the regionally large city of Victoria, Texas. Before coming to Victoria, I hadn’t realized that the Caterpillar maintains a production facility here. At first glance, I thought this was the headquarters, but a little research revealed that the company is based in Peoria, Illinois. There are several more operating locations scattered across Texas, but this one in particular fabricates hydraulic excavators. Who knew? 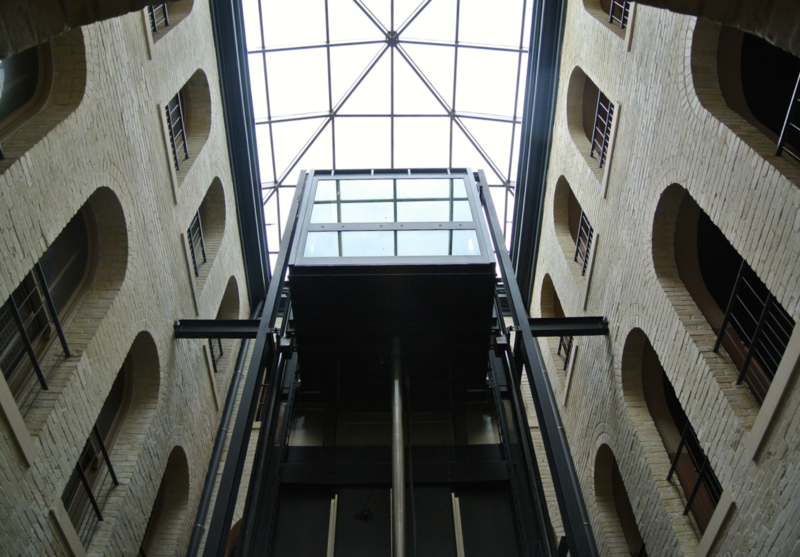 Unfortunately, the trend of modern courthouses in the area wasn’t broken by Victoria. 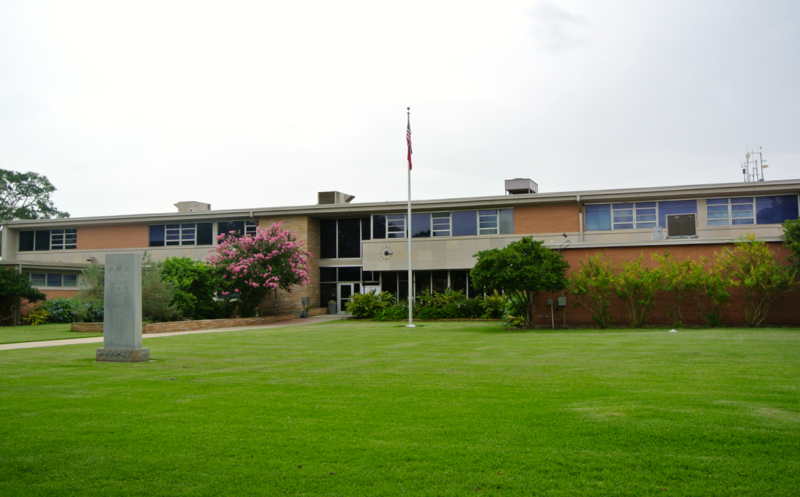 The current building, built in 1967, is as minimally pleasing as they come. But! There’s good news. This current courthouse isn’t the only one to see. I dare you to call this one modern. 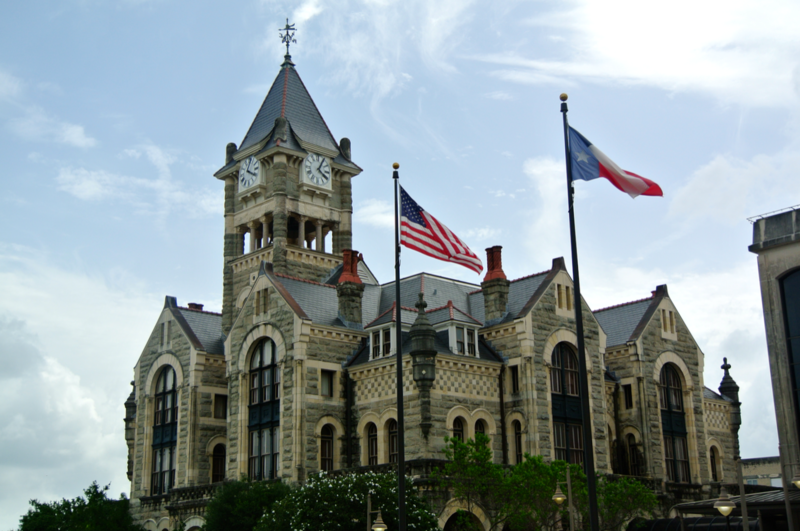 Built throughout the entirety of 1892, the original design was courtesy of James Riely Gordon, of San Antonio (the master of Texas courthouse architecture). The contract he and his partner, D.E. 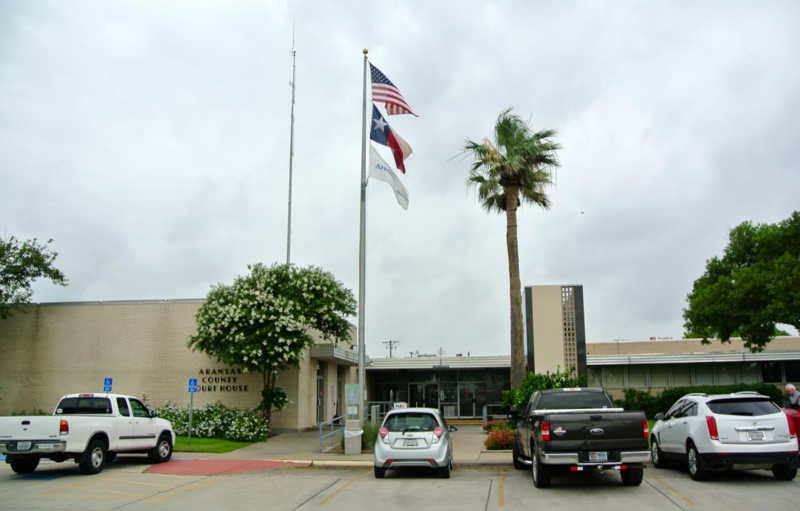 Laub, had with Victoria County maintained that they would be present every day of construction. Yet, Riely, who had many pressing commitments throughout the 1890s, couldn’t live up to this. He was fired in May. The contractors, Martin, Byrne, and Johnston (another famous architectural firm) added their “own flare” to it before it was finished. 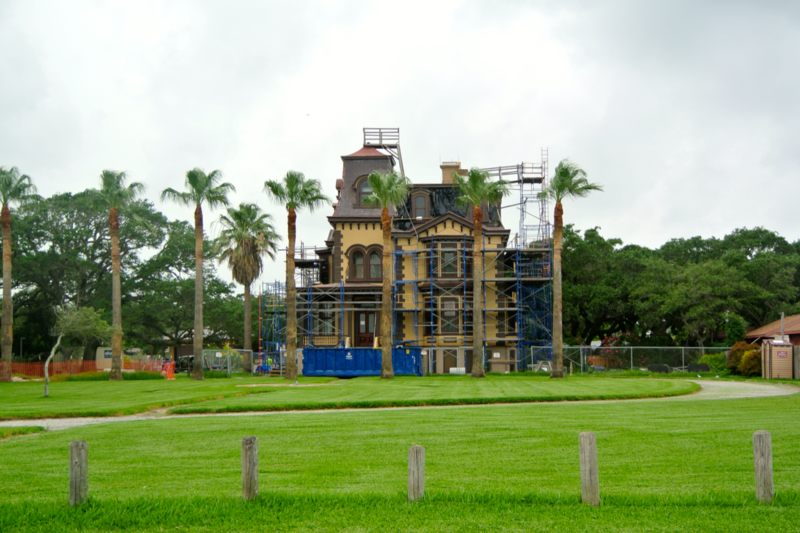 Upon completion in December, the county brought in Eugene Heiner from Houston (another member of Texas courthouse royalty) to approve the final product. 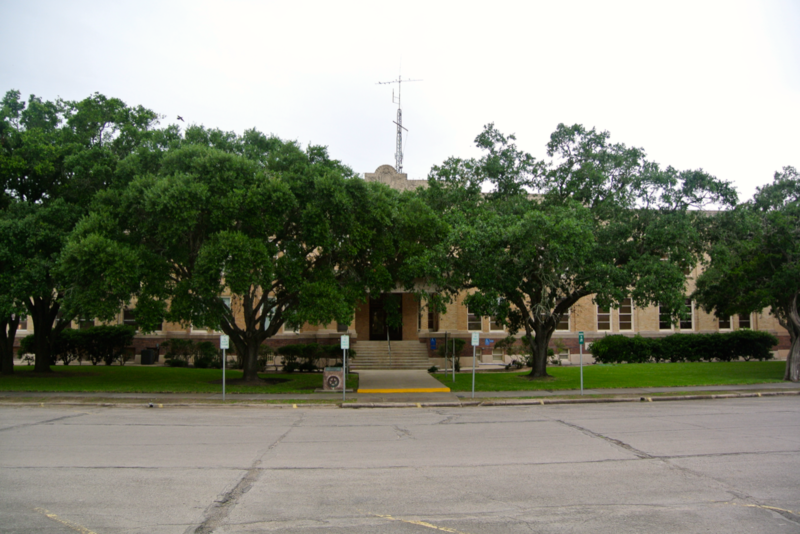 His support allowed the county to accept the courthouse on January 1, 1893. 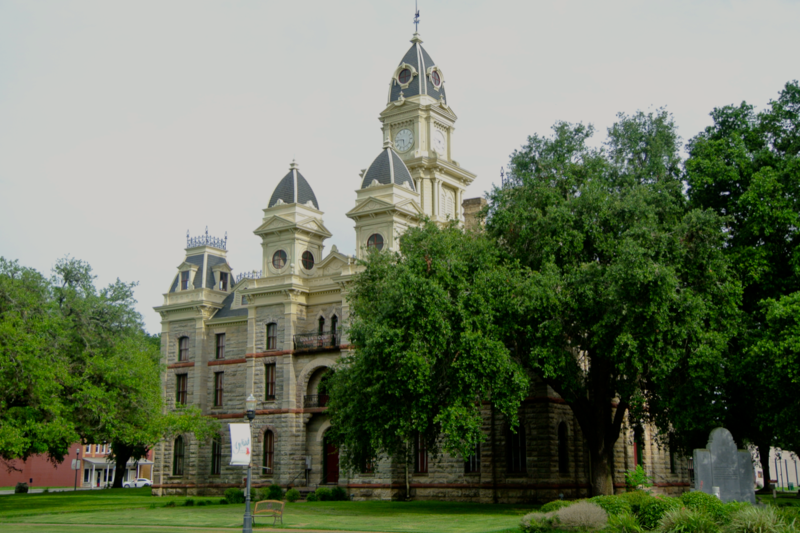 In the 1960s, the county decided to move to a new building, but thanks to the efforts of a petitioning, local citizens’ group, the 1892 courthouse was saved from demolition. 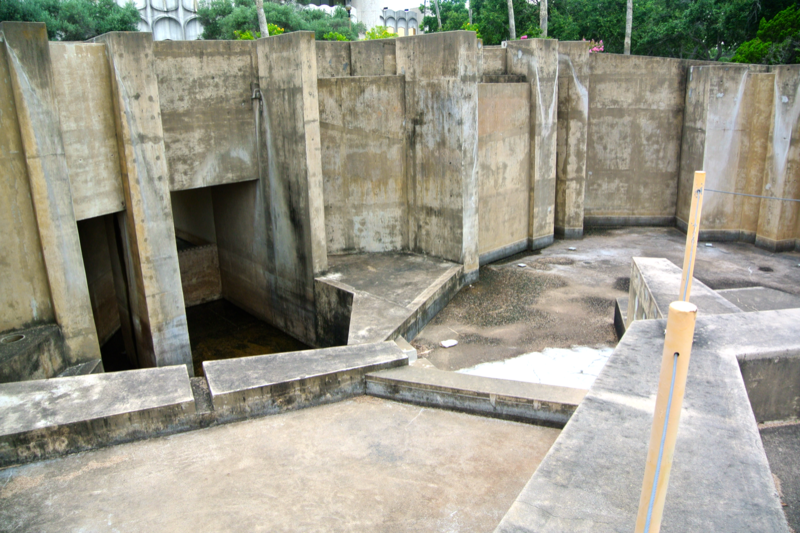 Today, the two stand side by side, and are connected with a tunnel that looks straight out of an aquarium. I almost expected to see sharks, rays, and sea turtles as I passed through. 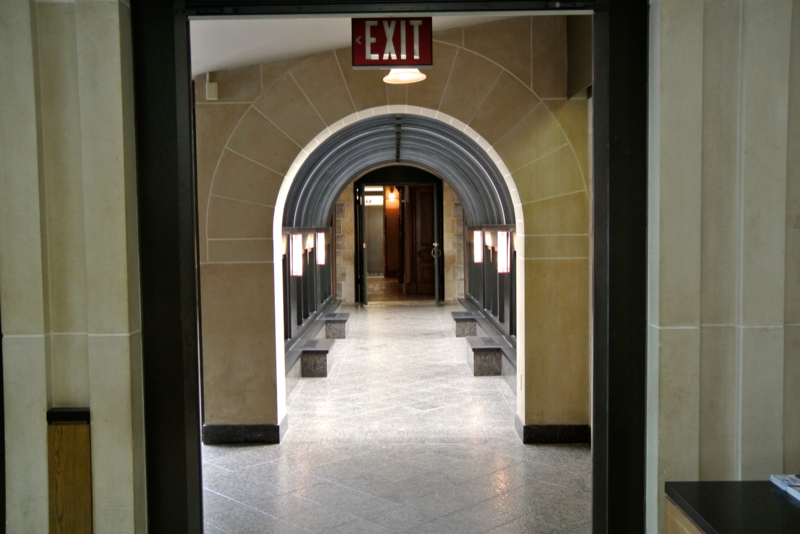 I first tried to enter the 1892 courthouse through its front door, but as I tried to step in, I found it locked. A cleaning lady on the inside pointed in the direction of the younger building and told me I first had to pass through security. The security guards were nice enough, but you could tell they didn’t mess around. 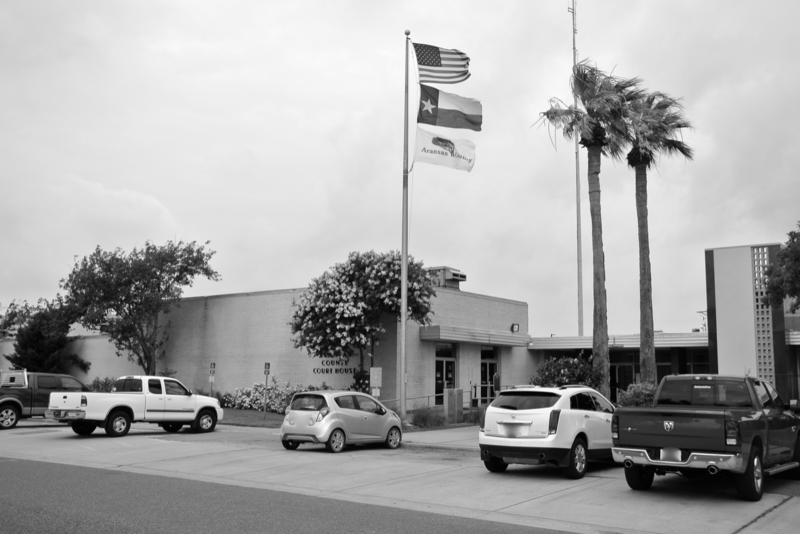 Still, they didn’t ask any questions about my right to photograph, as had been the case in Hansford and Webb Counties. I was grateful for that. 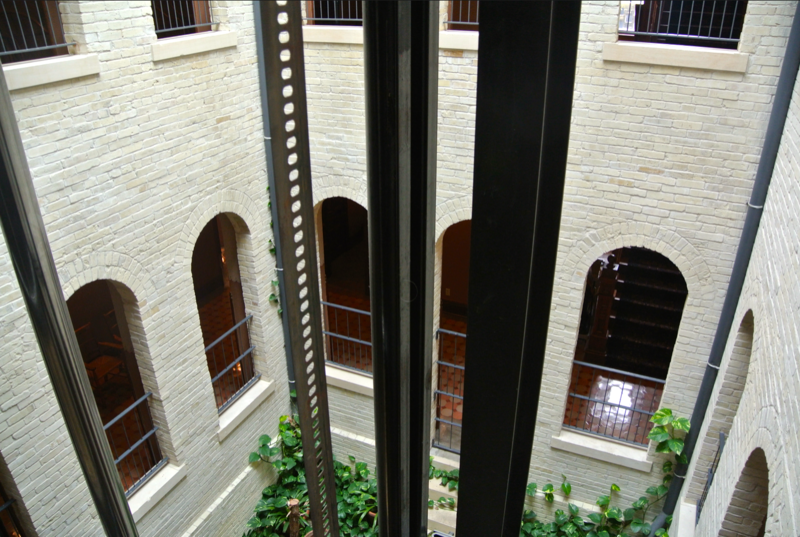 At the center of this courthouse is an atrium, like the one in Fayette County (also designed by Gordon, just a year earlier than this one), but Victoria County’s has an elevator. 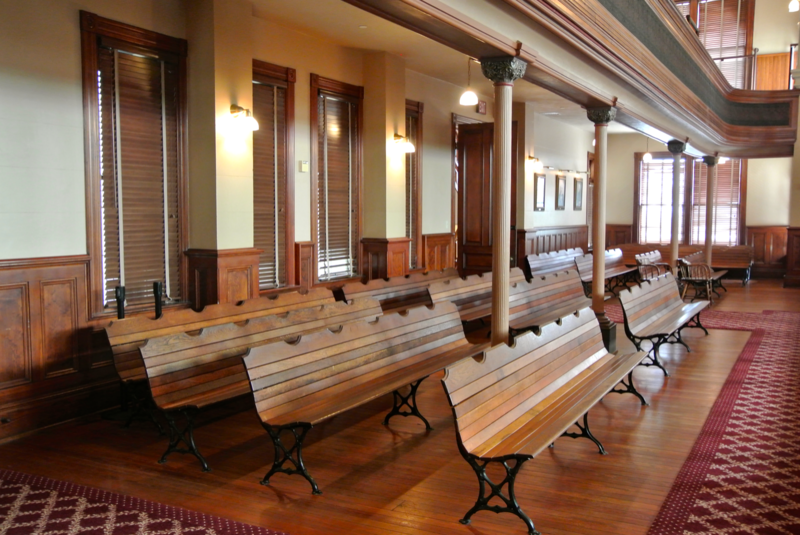 The second-floor courtroom (which is still used) is quite impressive. It’s to my understanding that the courthouse underwent a renovation in 2001, which I’m sure can be held responsible for making this room one of the finest I’ve seen in any courthouse. 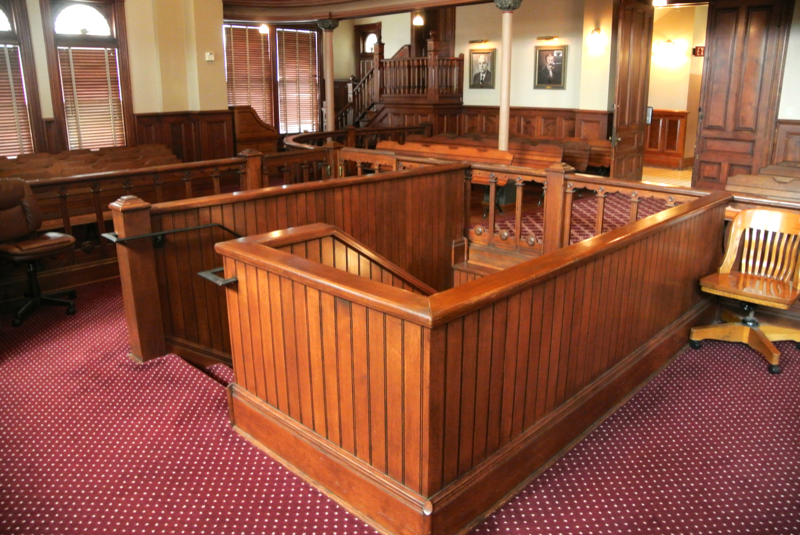 An interesting feature of this courtroom was a set of stairs, located behind the partition between the visitor’s sitting area and the judge’s/witness’/plaintiff’s/defense’s seats. I couldn’t resist seeing where they went. Turns out, I stumbled upon what I believe was the judge’s chambers and an emergency exit. Now, I figured I shouldn’t have been down here, so I began to make my way back up to the courtroom. That’s when I heard someone walking around above me. Sticking my head up ever so slightly, I spotted a woman walking towards the stairs. You can bet I quietly ran back down to the emergency door (located around the corner from the judge’s chambers) and waited a minute or two. When I thought she was gone, I quickly and silently made my retreat. From that point, I headed up to the third floor to try and take a picture of the courtroom from the balcony, but I found the doors locked. 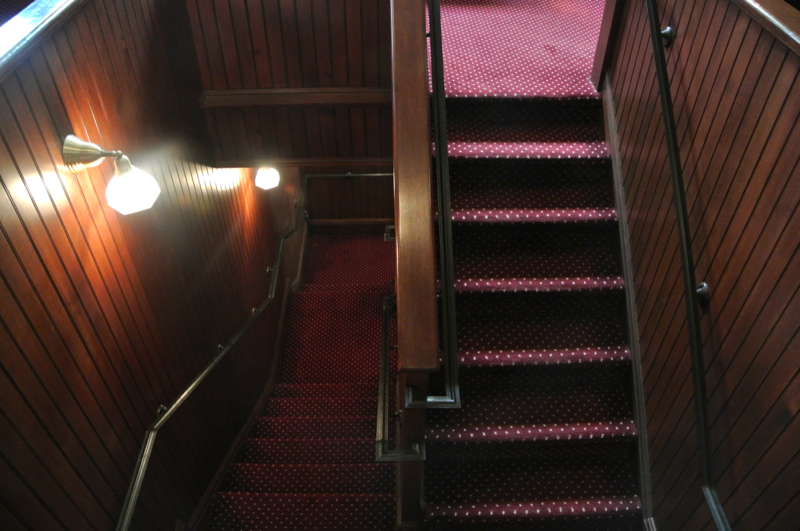 So, I thought I’d try out the elevator next, which was all glass on three of the four sides. 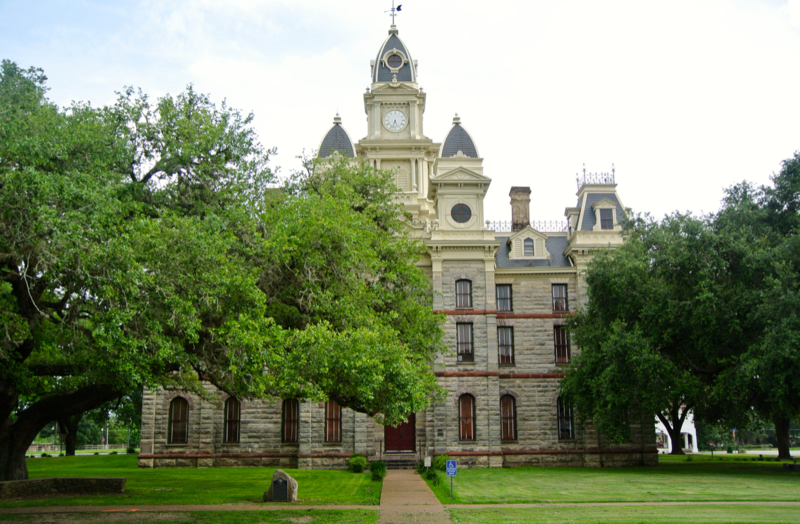 After exploring this courthouse (on the outside and inside) for nearly an hour, I climbed back in the car and left Victoria, headed west on Highway 59 again. 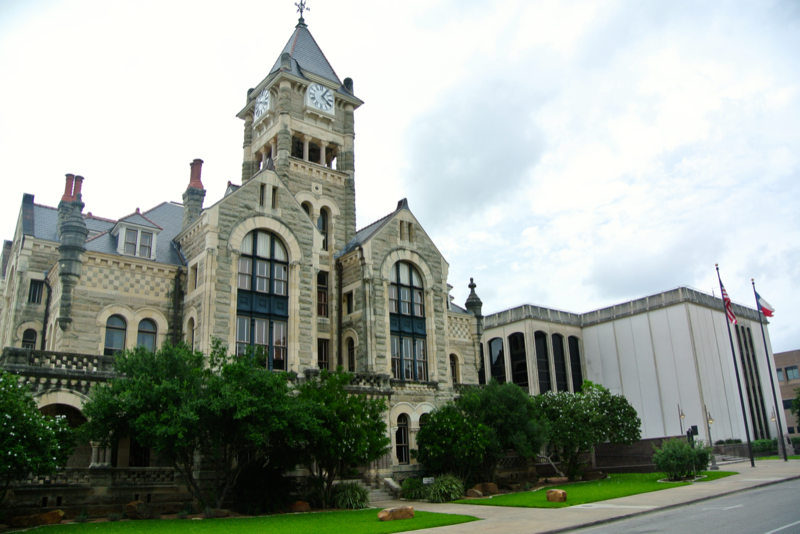 In March of 2012, I’d first come through the area I was now passing through: Goliad County. That year I’d been in seventh grade (the first year I really got interested in Texas History, as it was part of the curriculum). During a Spring Break trip to San Antonio, my grandfather, dad, and I took a day trip to Gonzales & Goliad, major spots in the tale of Texas Independence. 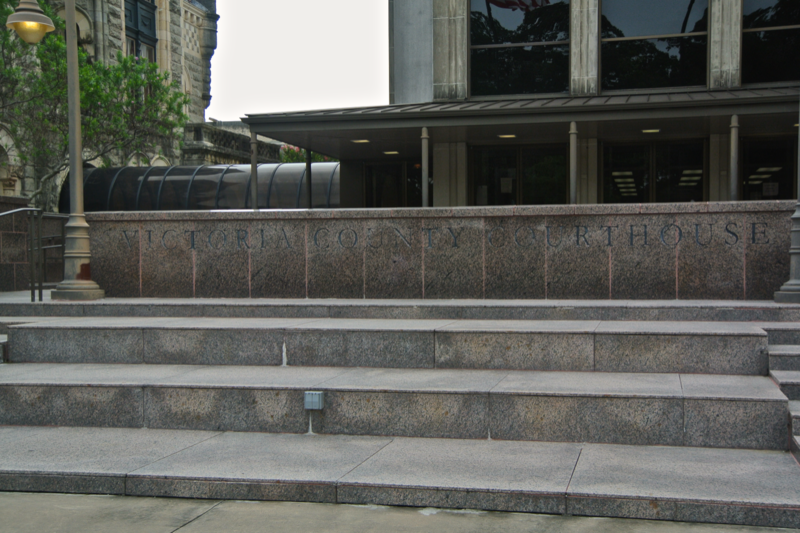 Of course, I also made a point to visit some courthouses that day as well. These included: Guadalupe, Gonzales, Lavaca, DeWitt, Goliad, Karnes, and Wilson Counties. All made the redo list. 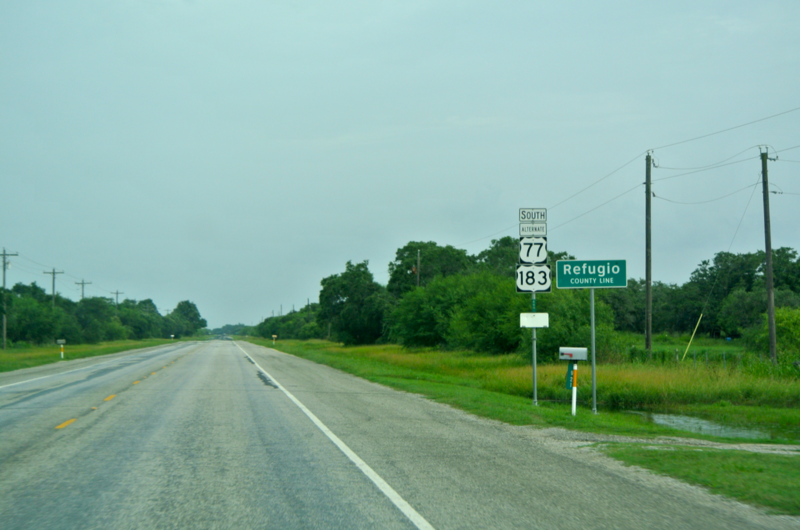 Before we arrived in Goliad to redo #48, our route first passed through the tiny town of Fannin. 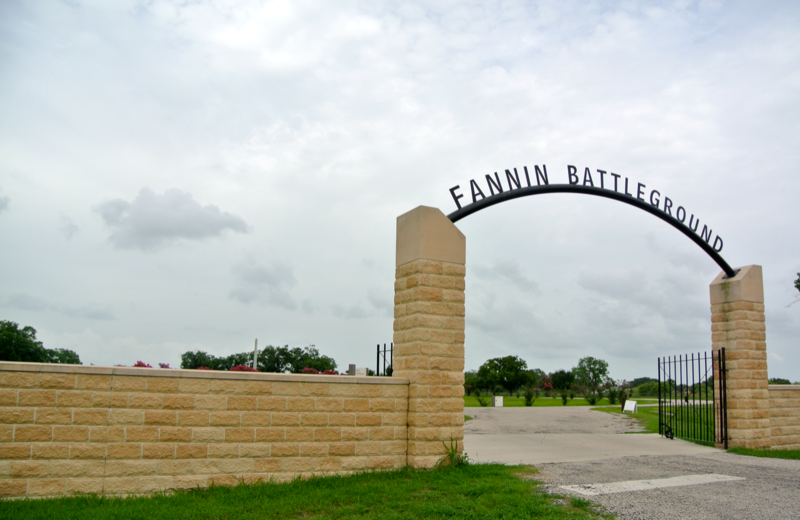 It’s obviously named after Colonel James Fannin (who died at Goliad). Back in 2012, I had no idea that there was any history to be seen here, but it turns out that the Coleto Creek Battlefield (today called the Fannin Battlefield) has been marked off as a historic site since 1914. 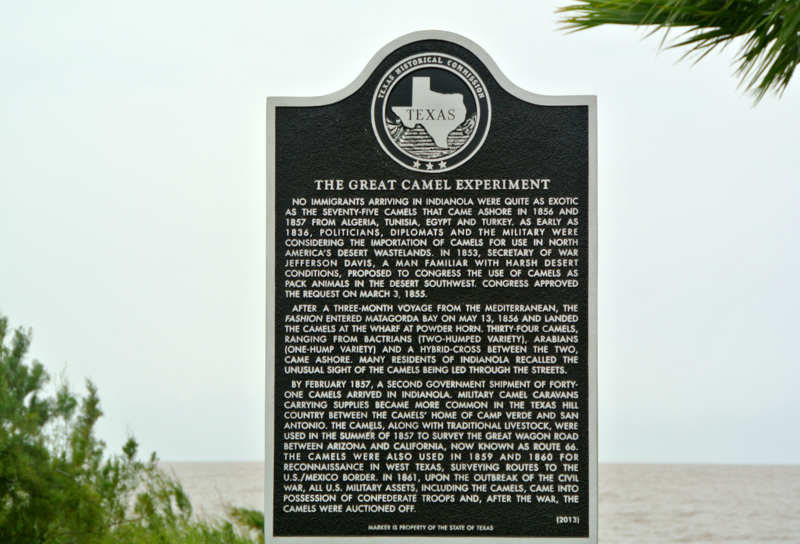 In the 60s, it transitioned under the care of the Texas Parks and Wildlife Department and sometime in the last few years, the THC took it over. Now knowing this existed, how can you imagine I’d pass it by without stopping? I’m not sure how I missed this in 2012. We hung around the Fannin Battleground for about six minutes. It was technically closed, but the gates were still open, which allowed me to get a few pictures. The following drive to nearby Goliad was not long. 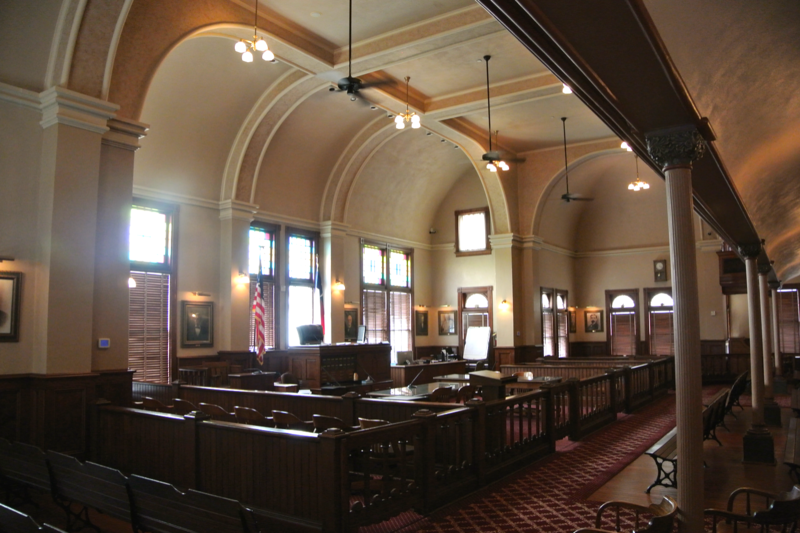 A signature work of Alfred Giles, this courthouse was constructed in 1894 at a whopping cost of $67,885.95. The tower you see above was ripped from the structure in a 1942 storm. Not until 2003 did the THC’s Courthouse Preservation Program restore it. This was an important redo. I never knew when I was going to get back down Goliad-way. Thankfully, the trip to Corpus cleared up that question in my mind. This, along with DeWitt County, were particularly out of the way. I’m fortunate to have been passing back through these areas. 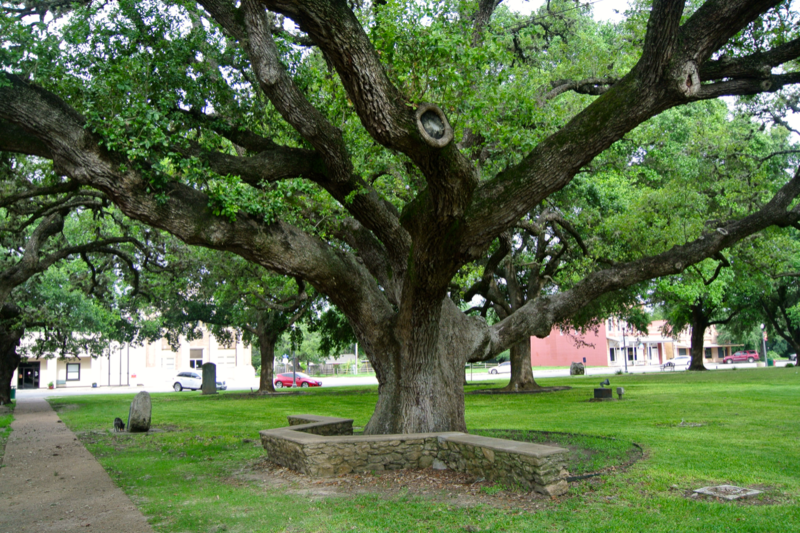 I recalled this tree on the courthouse lawn from my trip three years ago. Its thick, sturdy, and long branches made it perfect for the exact activity you’d expect. This is Goliad County’s hanging tree. 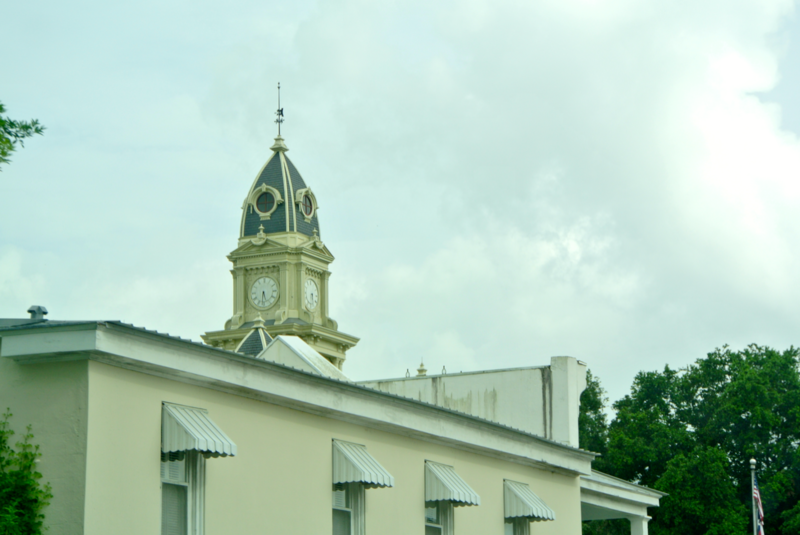 Photographing this courthouse was a bit tricky. Not only did the muggy and humid late afternoon heat bring out some of the largest mosquitoes I’ve ever seen, but my right side began to ache. Every time I lifted my arms up to get a picture, pain seared through my ribcage. I haven’t hurt since, so I’ve equated it to have just been from my excessive photography throughout the day. I was in Goliad from around 5:15 – 5:50, and we’d be at this since 9:00. It had been a long one. And there were still stops to make! The next one was just south of town, at El Presidio de Nuestra Señora de Loreto de la Bahía, or simply La Bahía (the bay), for short. 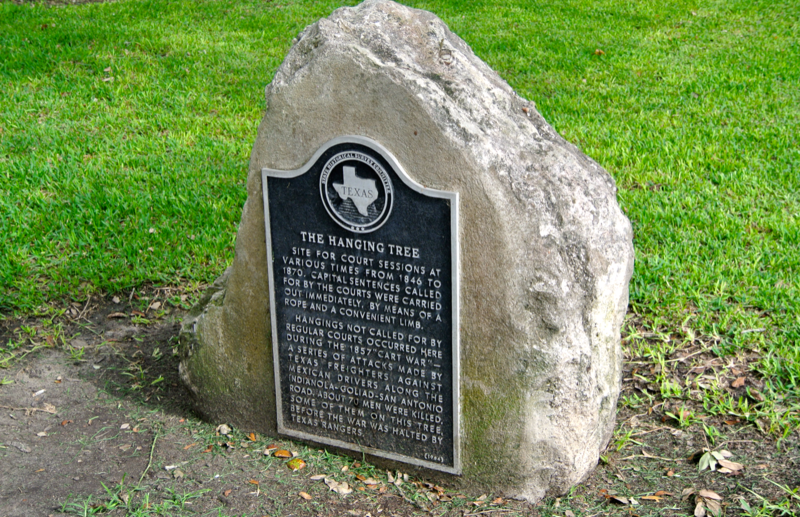 It was here that the men captured by General Urrea’s forces at Coleto (Fannin Battleground) were put to death on March 27, 1836 at the orders of Antonio Lopez de Santa Anna. Santa Anna, you may remember, was the Mexican president and chief antagonist of the Battle of the Alamo. Now I’d been here in 2012, but I sure wanted to come back and get some pictures with my camera. The museum of course was closed, but I got some shots of the outside. It’s said that many of the men were housed in that chapel you see there, while they waited for death. It’s a neat place to visit, though a depressing one. 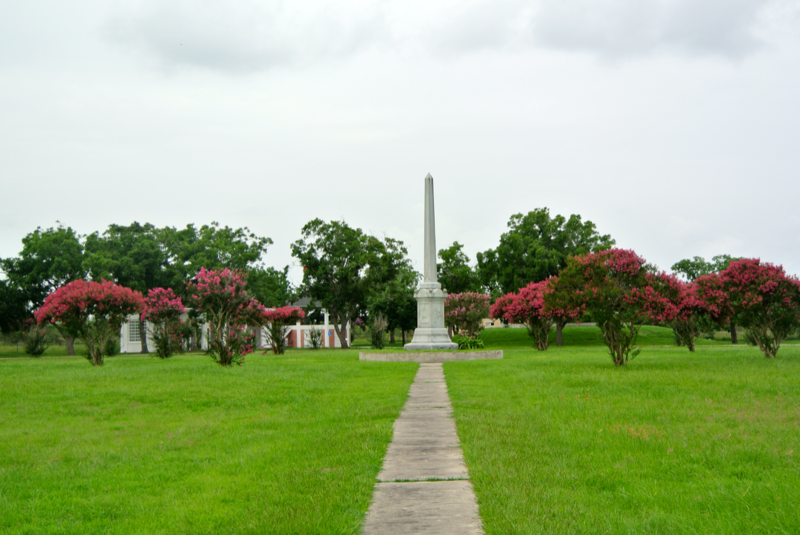 Also to see in Goliad is the mass grave of Fannin and his men. 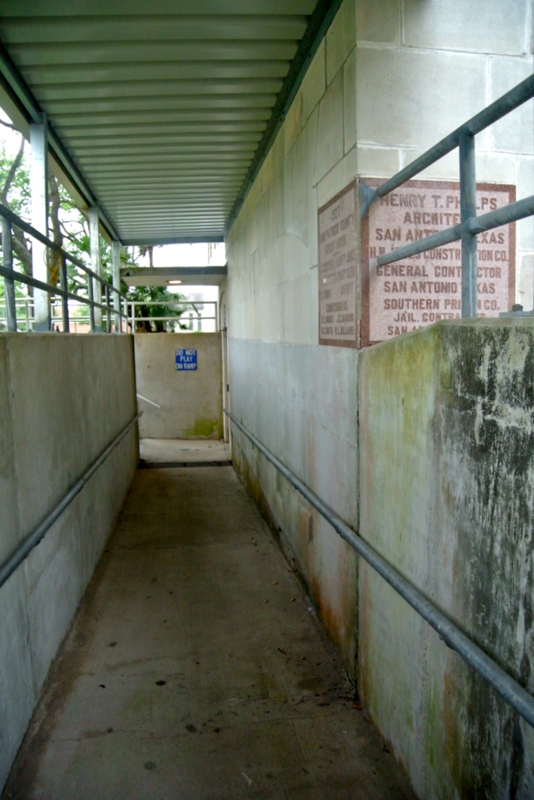 After the Goliad Massacre, many of the bodies were stacked and burned by the Mexican army. Yet three months later in June, there was obviously still enough carnage left to catch the eye of Thomas Rusk, as he passed through Goliad to pursue the fleeing Mexican forces (who were retreating after Santa Anna’s defeat at San Jacinto in April). He and his men buried the remains with military honors. According to one source I found, this gravesite was nearly lost to history. In 1858, a pile of rocks was placed by a local Goliad citizen where he assumed the grave was. In 1930, a Boy Scout troop made a macabre find when bones turned up while they explored the rocks. 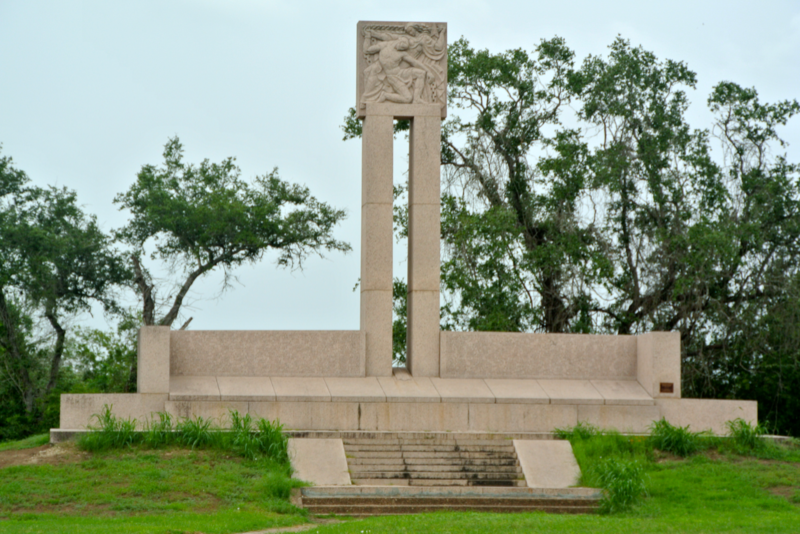 Sometime between 1930 and 1938, historians evaluated the authenticity of these remains, and when it was confirmed that they belonged to the victims of Goliad, a granite memorial was built over the grave. 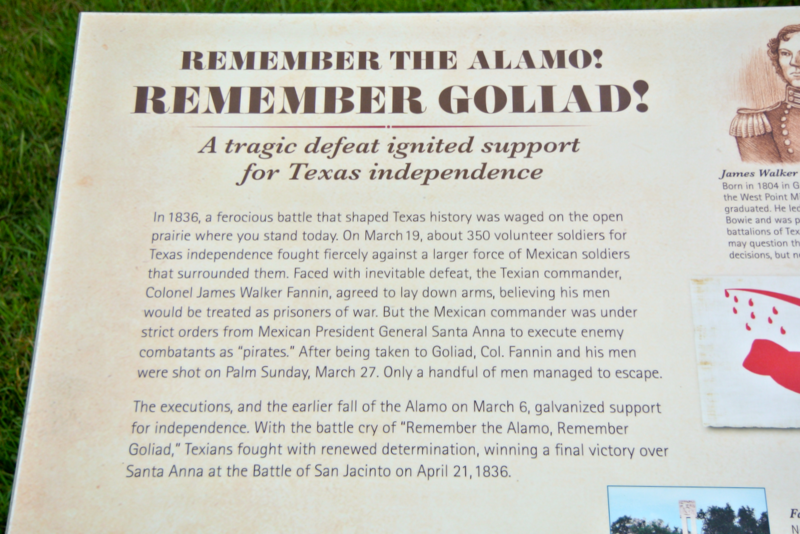 After we paid our respects to the fallen of Goliad, we took off down Highway 77. There were still two more courthouses to see. Refugio County was the next one. 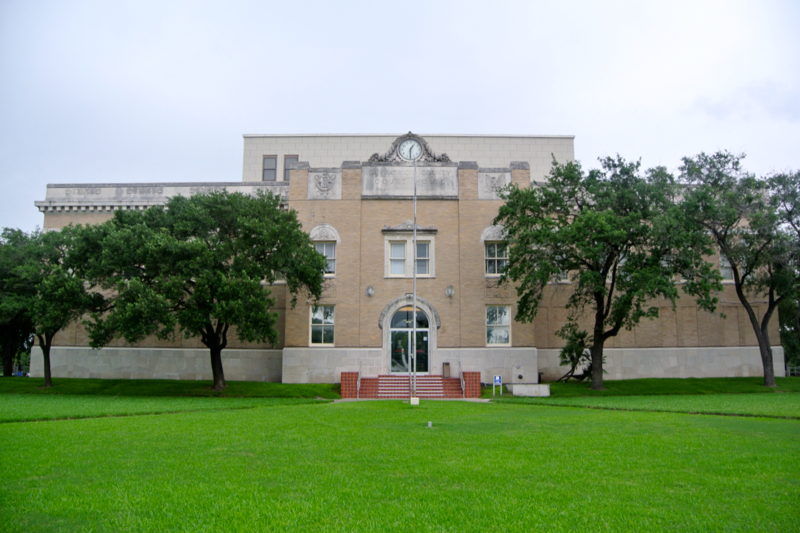 At about 6:20 we pulled up in front of the Refugio County courthouse, and though the sun had begun its descent, I still had ample time to photograph #206 on my list. I mentioned that the mosquitoes down this way are massive. As my grandmother would put it, “you could put saddles on ‘em”. Humid weather, standing water, and mosquitoes are an explosive recipe in South Texas. West Nile Disease and the rest of the mosquito-carried sicknesses are all very real threats down this way. 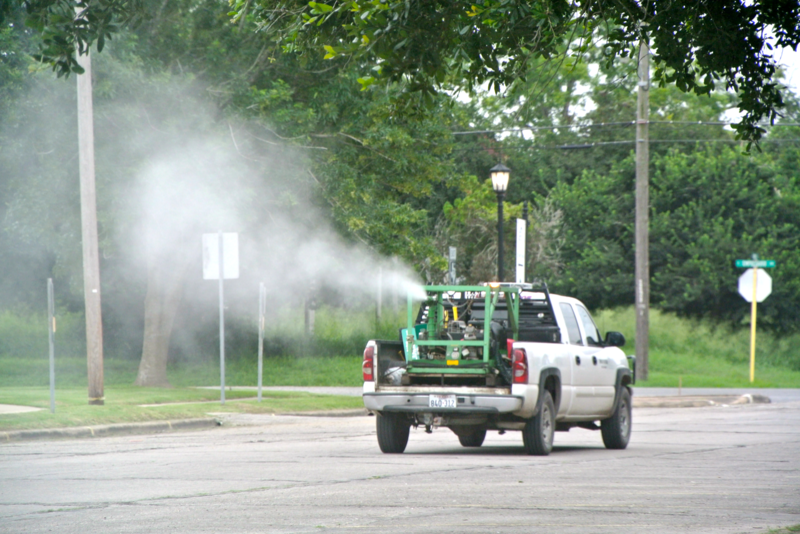 That’s why, as we arrived at the Refugio County courthouse, a mosquito sprayer came rumbling down the street. I had to wait a minute or so for the chemicals to disperse before I could climb out of the car and take my pictures. Even though the county had just sprayed, I still had to slap a mosquito or two off of me as I went about all sides of this building. I thought North Texas had them bad! 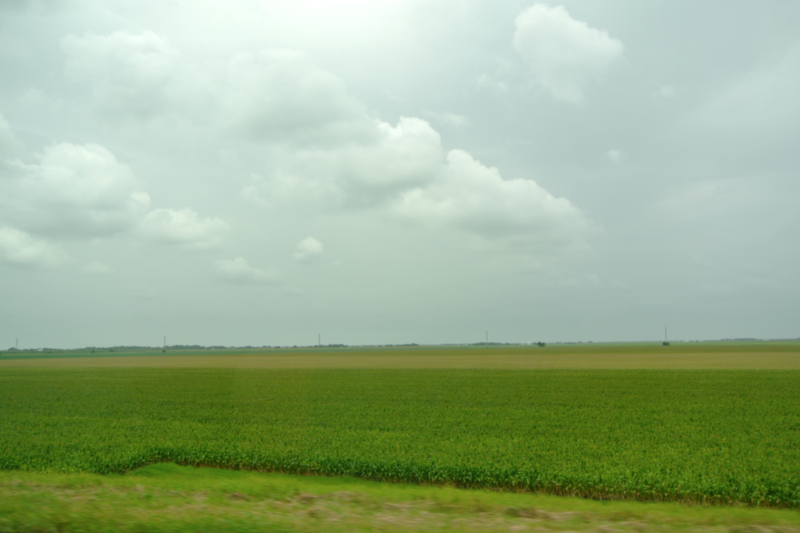 With 6 new courthouses, 1 redo, 2 historic sites, and a side-trip to Indianola down, we embarked on the final stretch of our journey with a fair amount of light left (though the clouds had gotten progressively darker). 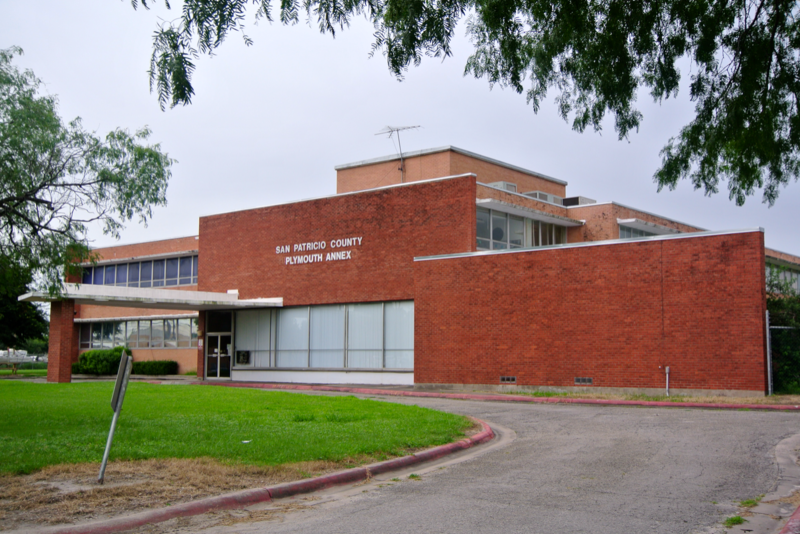 The last courthouse stop of the day was in San Patricio County. 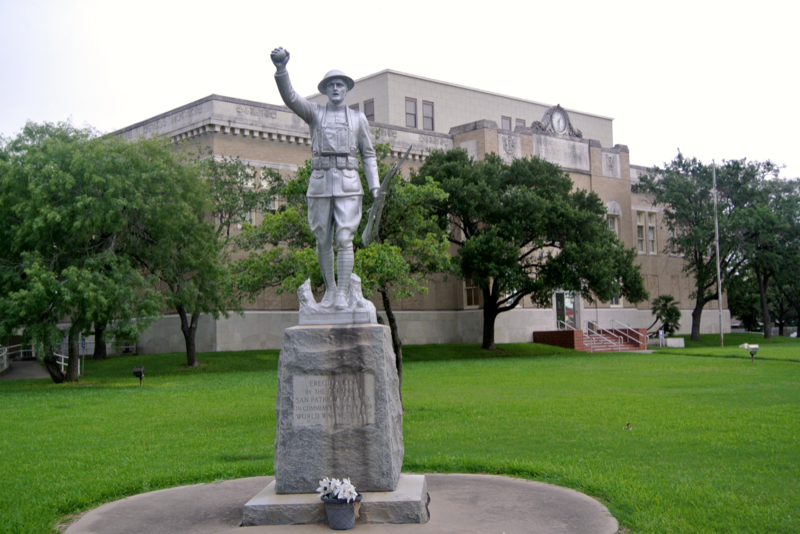 That statue there is called “Spirit of the American Doughboy”, and is a memorial to “Word War Veterans”. 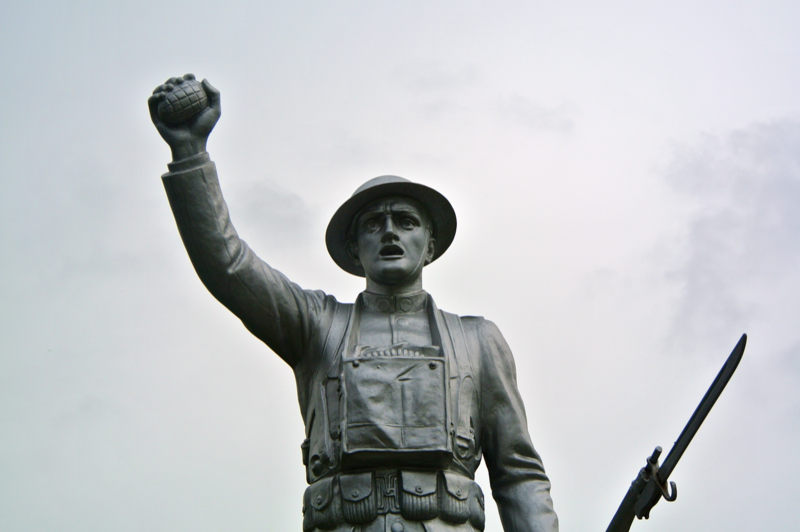 The term doughboy was heavily used in WWI, but according to the statue, it’s a veterans monument to soldiers from both I and II. The cornerstone of this building was a little tricky to get to. The doughboy’s cheer was similar to my own as I completed the final courthouse of the day. Gosh, it was a long one. But it wasn’t over yet. 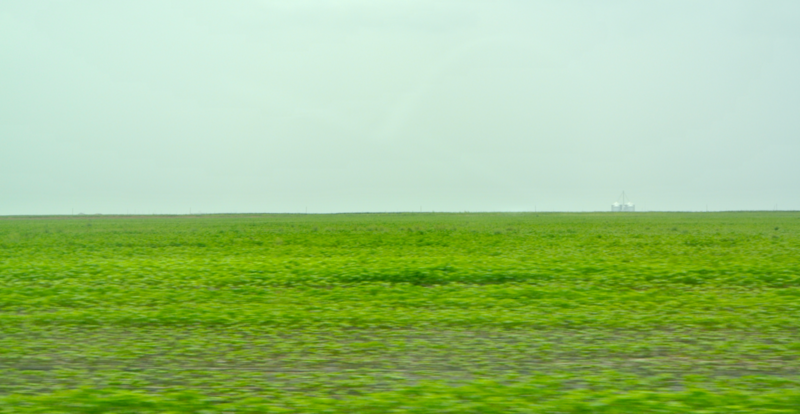 To get back to Corpus Christi, we booked it east on Highway 181 to the farming community of Taft. 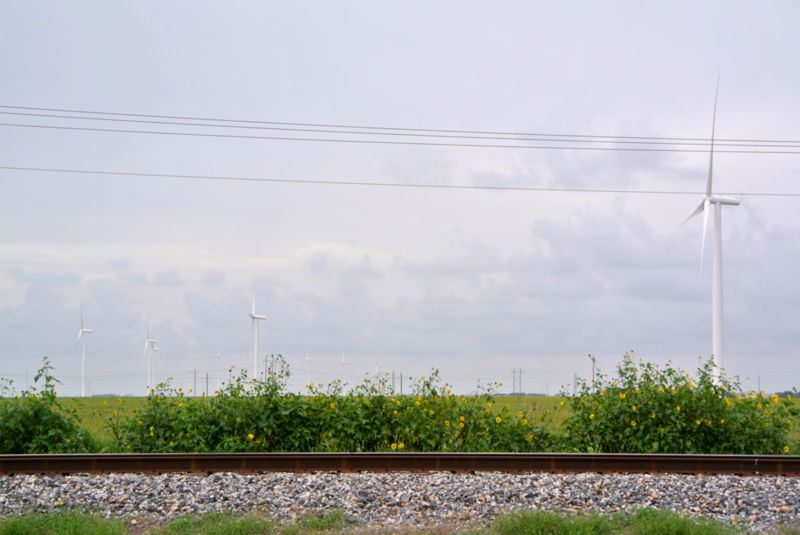 Surrounding Taft are fields and fields of wind turbines, just like those you’d find populating the High Plains and Panhandle. 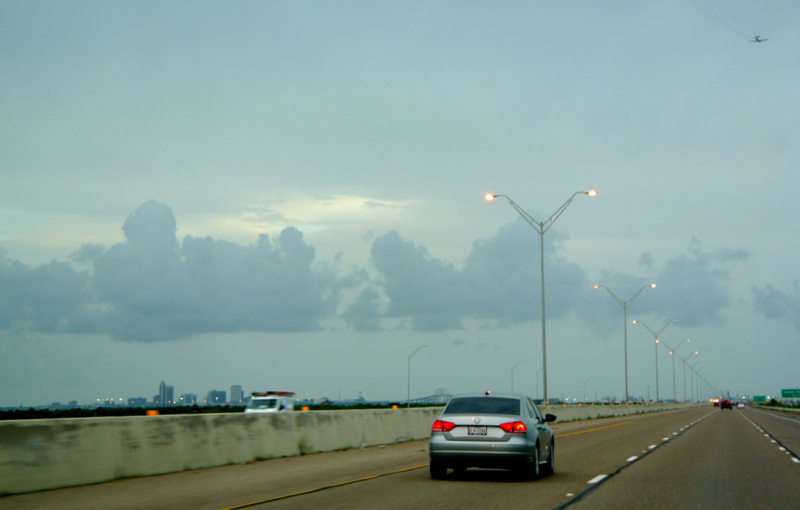 In another twenty minutes or so, we had exited for Highway 35 southbound, in Portland (the path back to Corpus). Even before we crossed the bridge to North Beach, the city sprang up in the horizon. You can tell here that it was getting darker. 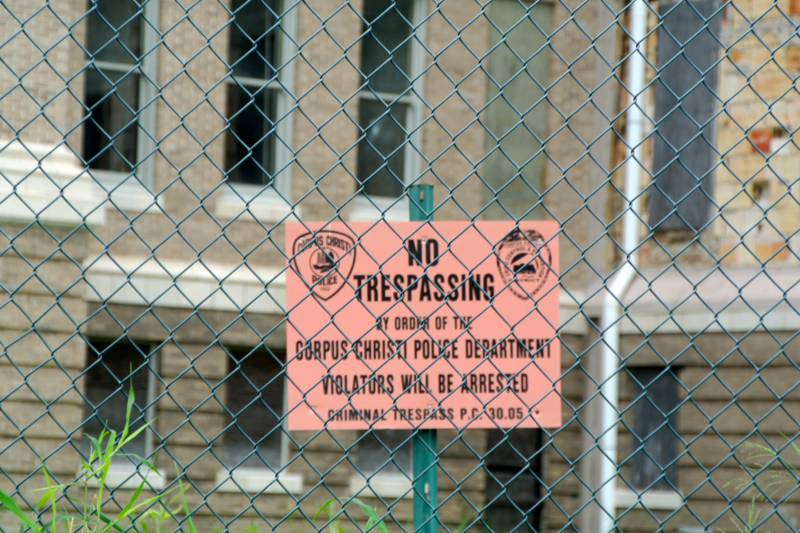 As we traveled, the lights of Corpus Christi began to flicker on, seemingly welcoming us home from our long day of courthousing. The last stop of the day before retiring for the evening, was dinner, which we had at Harrison’s Landing (a small restaurant, right on the bay). The food was fine, I guess. Let’s just say that Rusty’s (lunch) was much better. Today was one of the longest days I believe I have ever had during this project. You better believe it was worth it, though. We made an important dent in that 54 I’d had left in August 2014. As I went to sleep, I realized my new count was 47. What a day!